It's been a busy spring of service for our Rotary Club. 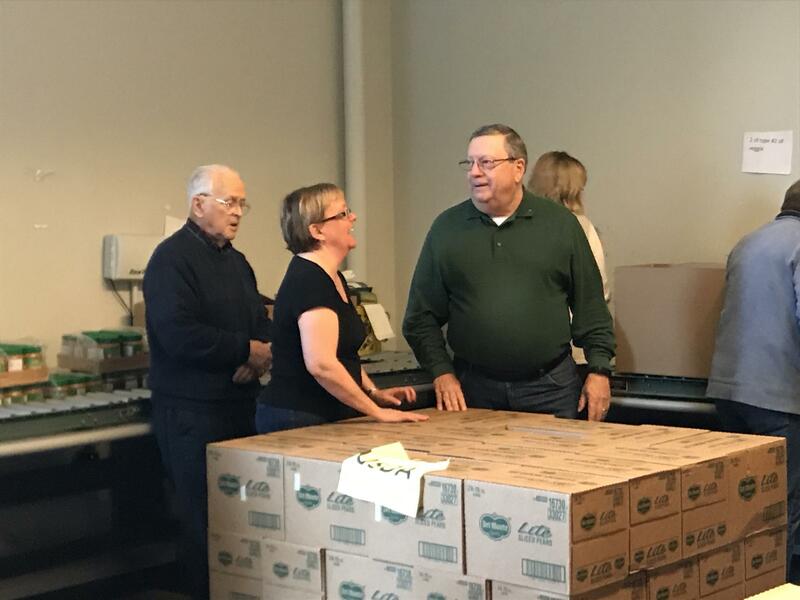 On March 13, a group of 17 members helped to package food for homebound seniors at Cross Lines Community Outreach. Not to brag or anything, but we were so efficient that staff had to stop us a bit earlier because we had packaged over 300 boxes and they wanted to make sure the next group coming in had enough to do. 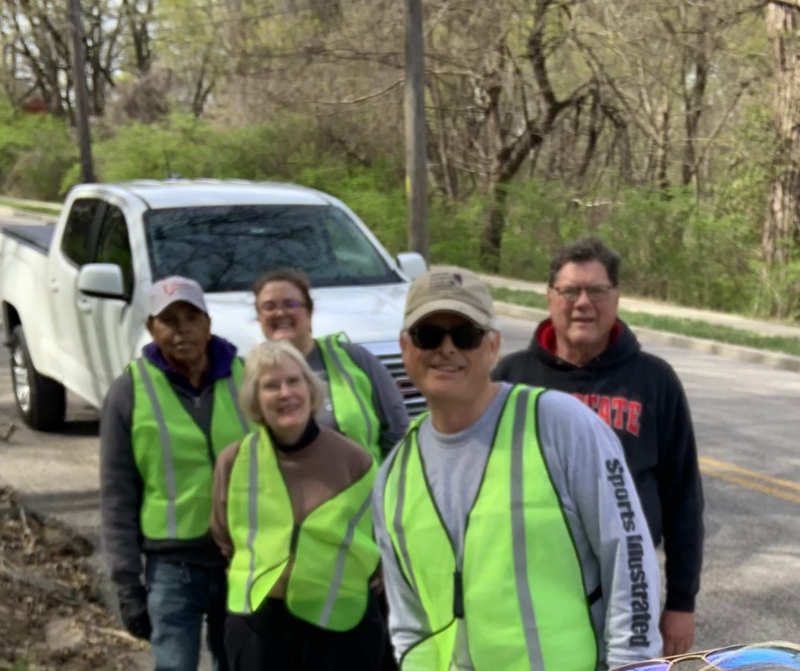 On the morning of April 13th, six KCK Rotary Club members braved cool temperatures, trash, and thigh burn to help clean up 10th and Douglas and the HUGE hill on 14th and Ruby in Kansas City, KS. 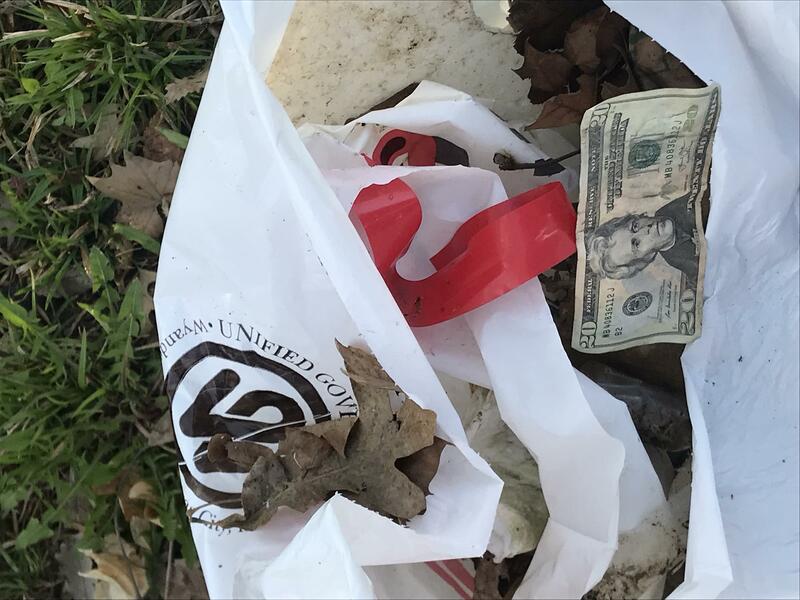 We collected 18 bags of trash and five fire extinguishers, three pairs of baseball pants, and one $20 bill that became a donation to Rosedale Development Association. With lots of laughter and squats, we were able to help our friends at Rosedale Development Association make the neighborhood a bit cleaner. 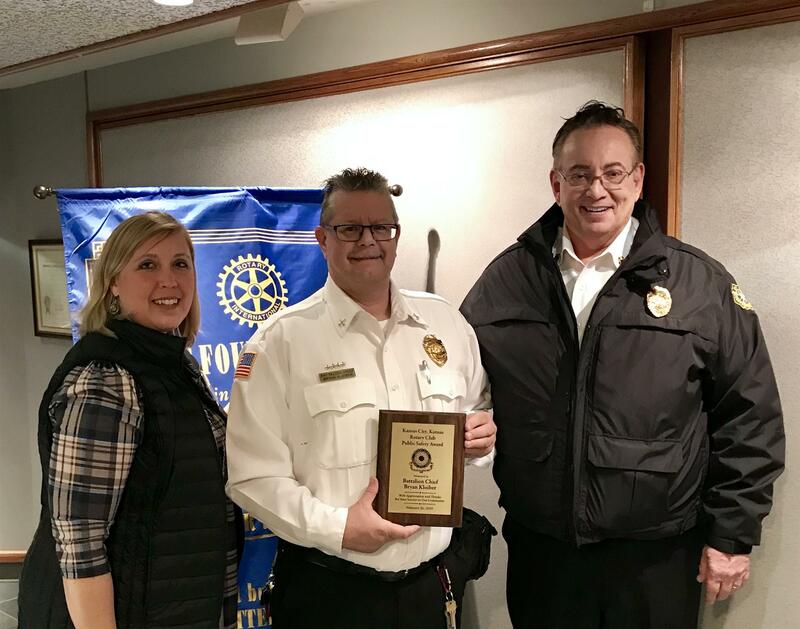 The Kansas City, Kansas Rotary Club, at its February 26, 2019, luncheon, recognized the 2018 Public Safety professional from the Kansas City, Kansas Fire Department. We got a late start on the 2018 recipient due to the hiring of a new Fire Chief for the department. Annually the Club recognizes an outstanding public safety professional from the Fire Department. This Kansas City, Kansas Rotary Club program demonstrates and shows appreciation to the individuals who do so much to protect our community. The leadership of the Fire Department selects an outstanding individual(s) from their department to receive this award, recognizing the individual’s dedication and service to our community. We would like to extend our gratitude to Battalion Chief Bryan Kloiber. He is a prime example of the great men and women of the KCK Fire Department who are protecting us every day. At the award presentation, new Chief Michael Callahan introduced Bryan and told of his efforts as a fire investigator for the department. 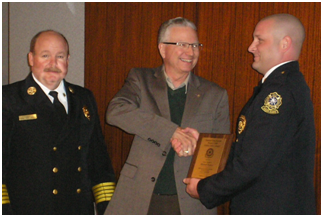 It was pointed out that Chief Kloiber was also named Kansas State Investigator of the Year. 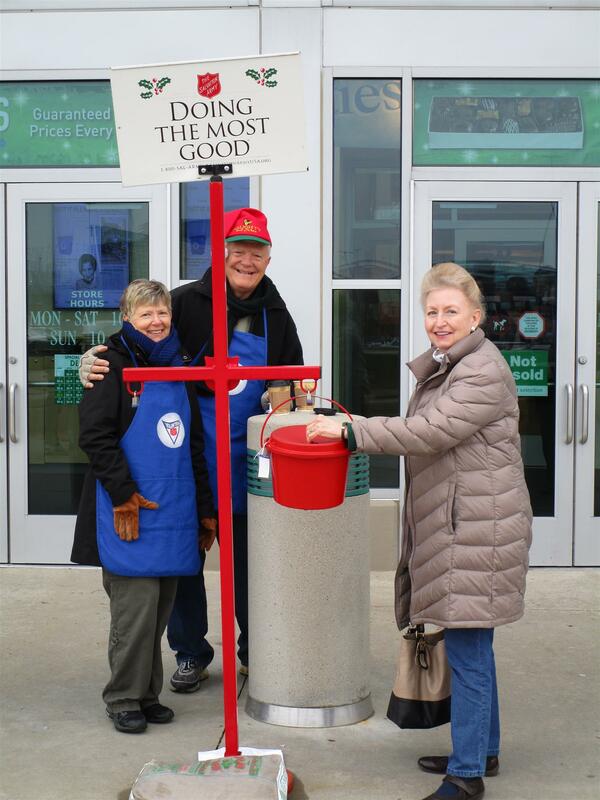 On a cool and wet December 1, 2018 members of the Kansas City Kansas Rotary Club rang bells for the Salvation Army at Nebraska Furniture Mart. Members participating included John Bukaty, Pat Crilly, Scott Kaufmann, Jim Knight, Merle Parks, Bill Porter and Greg Shondell. A special thanks to Phil Gibbs for organizing the project. Greg Shondell and Pat Crilly helping out. The Kansas City, Kansas Rotary Club, at its December 4, 2018 luncheon, recognized this year’s Public Safety professional from the Kansas City, Kansas Police Department. Annually the Club recognizes an outstanding public safety professional from the Police Department. This Kansas City, Kansas Rotary Club program demonstrates and shows appreciation to the individuals who do so much to protect our community. The leadership of the Police Department selects an outstanding individual from their department to receive this award, recognizing the individual’s dedication and service to our community. We would like to extend our appreciation to Matt Tomesic. Matt was introduced by Assistant Police Chief Pamela Waldeck. Matt is retired from a local police department after 23 years of service. In conjunction with the Kansas City, Kansas Police Department, he has started a Police Athletic League to provide youth programs in KCK. The program is renovating the old St. Mary's Church building on 5th Street. They will be offering boxing, gardening and bee keeping to start, and adding more programs in the future. 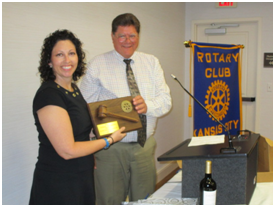 At the Rotary District 5710 Foundation Banquet on November 3rd, the Kansas City Kansas Rotary Club was recognized with 3 district awards. 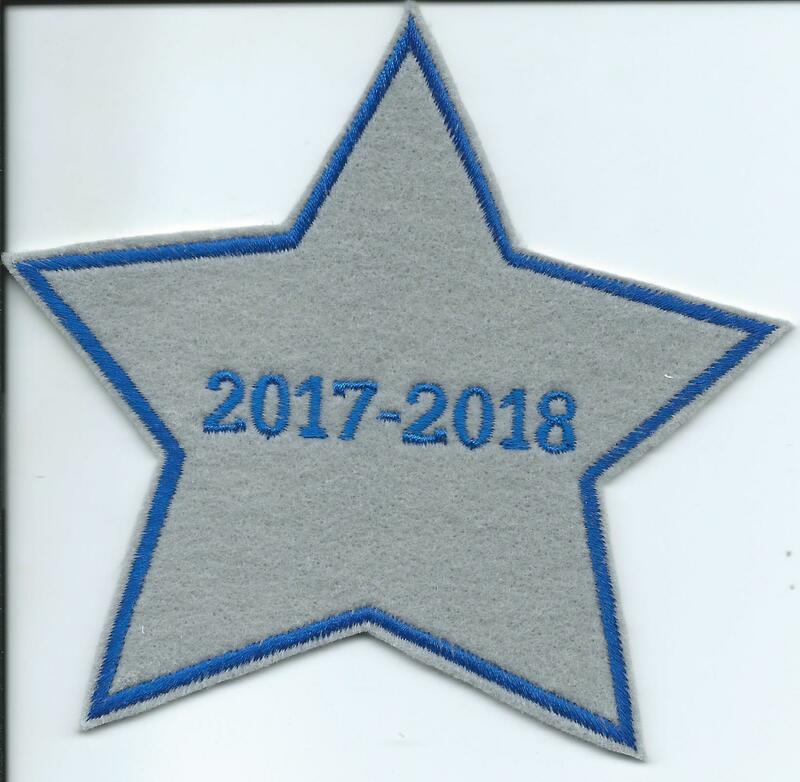 The first award was a 2017-2018 Silver Star for membership growth of 5 new members. 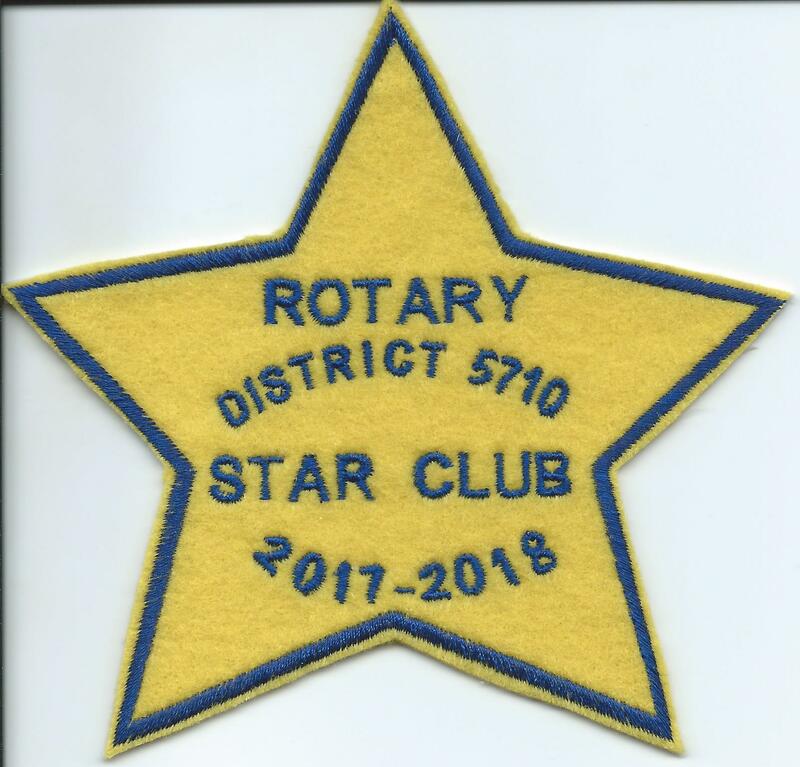 The second award was a 2017-2018 Gold Star signifying "Star Club" status for an average contribution of over $100/member to The Rotary Foundation. 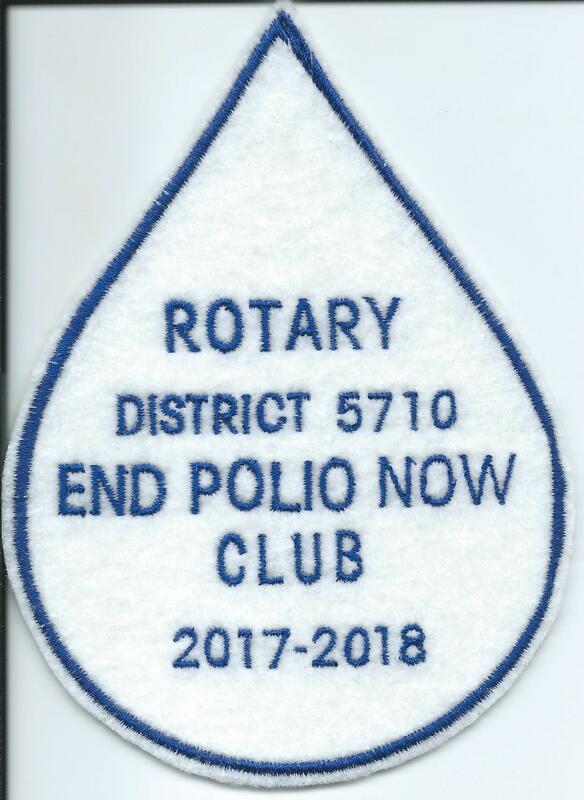 The third award was a 2017-2018 white Polio Drop for exceeding $1500 in club donations to the Polio Plus campaign to eradicate polio in the world. The Kansas City, Kansas Rotary Club is dedicated to community service, and has completed a community wide beautification project. 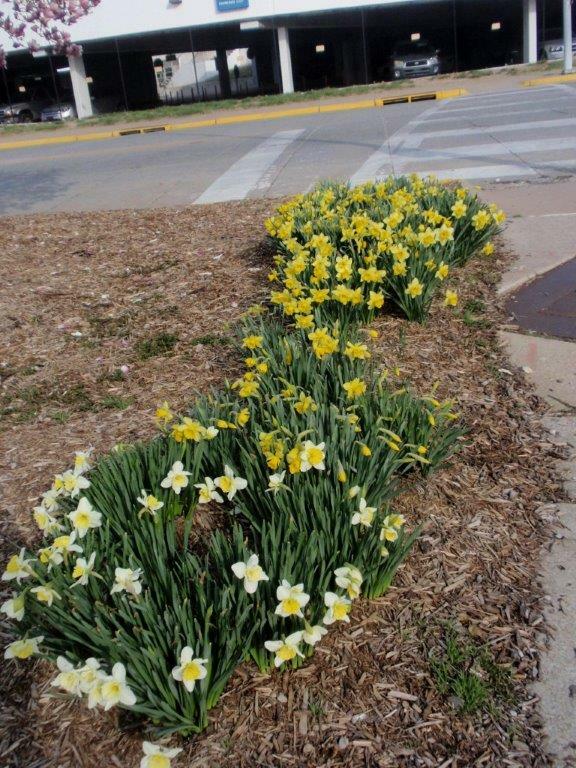 For the fifth year, the club purchased over 1,000 daffodil bulbs that were planted during October throughout the Wyandotte county area. 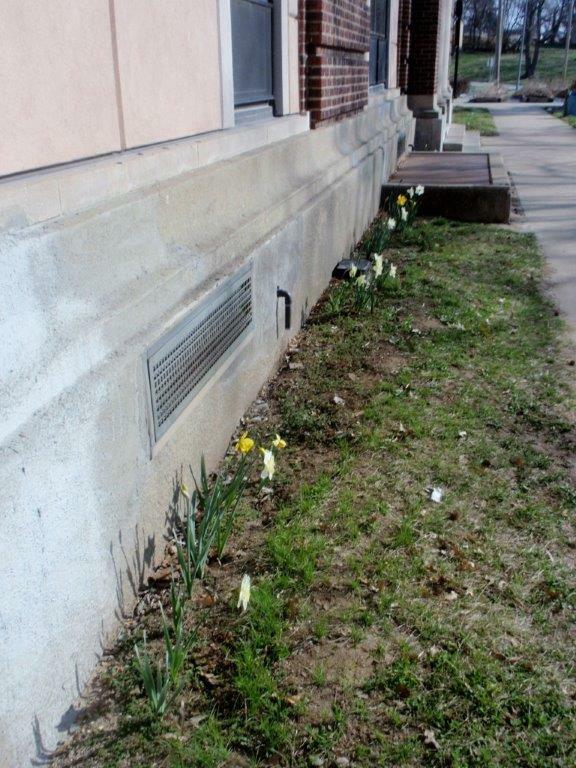 Daffodils are inexpensive, self-propagating and perennial plants that offer Spring beauty, yet are resistant to pests. There are a wide variety of species, which can make for interesting diversity in floral displays. The plantings were done by Rotarians, volunteers, and youth from elementary, middle and high schools. The plantings were carried out in chosen locations, visible to the community, in designated public areas of school grounds, where the flowers will not be likely mowed during the year. 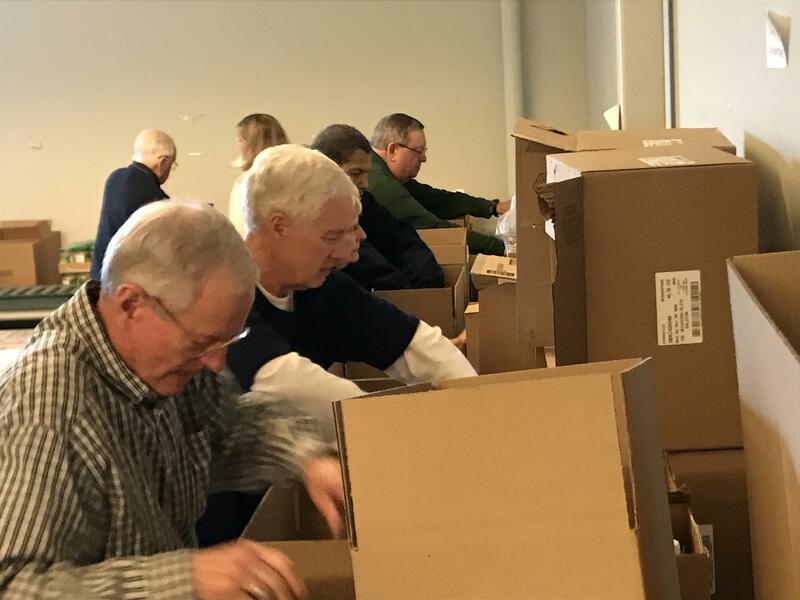 The Kansas City Kansas Rotary Club helped to support Riverview Health Services' free Flu Shoot Clinic Plus, with members filling personal hygiene bags. The bags were distributed on October 6th at the clinic, along with the flu shoots and other medical services. 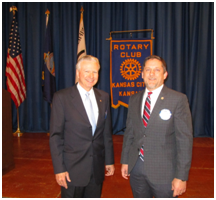 On June 5, 2018, the Rotary Club of Kansas City, Kansas hosted the annual State of the Unified Government of Wyandotte County and Kansas City, Kansas. The Club has a long history of hosting this annual address, dating back to the 1960’s. Mayor David Alvey delivered his first address as Mayor of Wyandotte County. An estimated 350 people were in attendance to hear the mayor. He spoke about building and supporting strong neighborhoods which are key to the future of KCK. The mayor is calling for a better quality of life for KCK residents and increased economic growth by improving the traditional neighborhoods in the city. “We must pay more attention to our neighborhoods, because our neighbors deserve a better quality of life and because only by improving the quality of life in our neighborhoods will we grow our tax base,” according to Mayor Alvey. 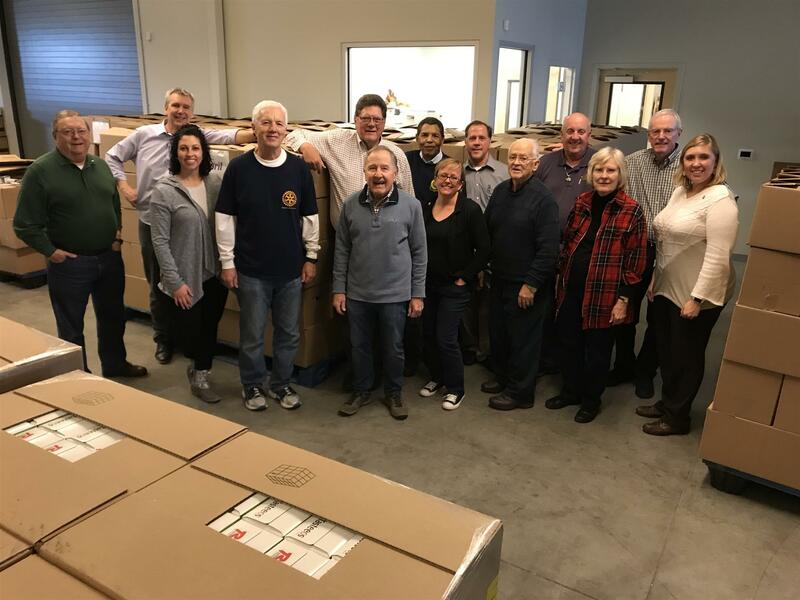 The Kansas City, Kansas Rotary, as a community service project, assembled 13 ‘Welcome Baskets’ for the Veterans Community Project and the residents of their new Veteran Village of tiny homes. Over several meetings the club collected personal hygiene items that would then be given to the new residents of the Veteran Village. 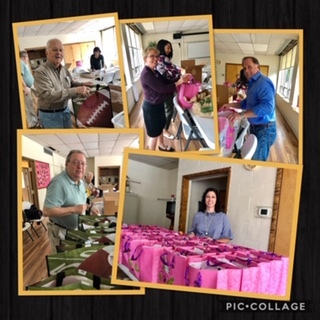 During the club’s May 29th meeting, members presented the baskets to the Veterans Community Project and toured the facilities at 8900 Troost Ave. in KCMO. 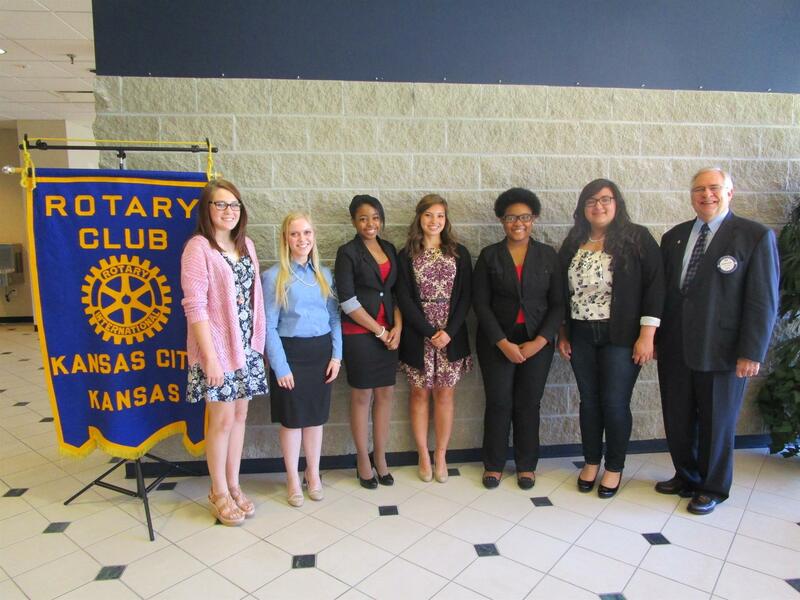 The Kansas City, Kansas Rotary Club announced the winners of its annual Student Scholarship Contest and recognized outstanding educators from each of the Wyandotte County high schools at the Club’s May 1st luncheon meeting. The Club awarded $1,000 college scholarships to each of two area high school seniors: Suan Sonna and Vanessa Obi, both from Sumner Academy. The Club awards these scholarships to the top female and male students who participate in the Club’s scholarship speech contest. These students competed with other outstanding high school students from our Wyandotte County schools. All the students exemplify the highest academic, service and character standards in our community. We can all be proud of what Wyandotte County has helped produce in these students. 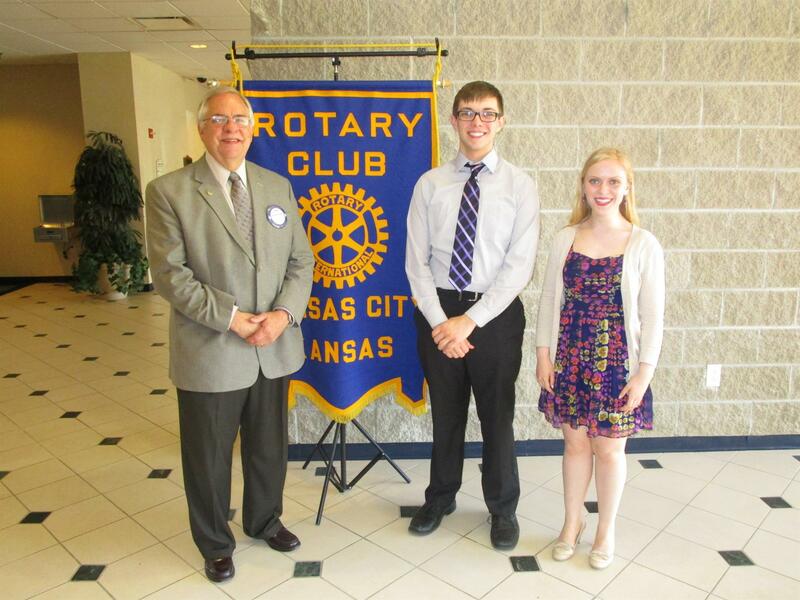 The Kansas City, Kansas Rotary Club congratulates them and wishes them the best in their pursuit of higher education. In addition that day, the Club recognized outstanding teachers from each of Wyandotte County's nine high schools. This annual program of the Kansas City, Kansas Rotary Club honors teachers in the county who represent the best of our community. The teachers were introduced by the respective school’s administrator, and the Club learned of each teacher’s unique contributions to the individual schools. Each educator was presented a plaque of appreciation. We are grateful to these teachers who give so much of themselves to educate and prepare our youth for the future. The Kansas City, Kansas Rotary Club, as part of its annual Student Scholarship Contest, recognized outstanding high school students from Wyandotte county schools. One female and one male student from each school are nominated by their respective schools to compete for $1,000 college scholarships. All the students exemplify the highest academic, service and character standards in our community. We can all be proud of what Wyandotte county has helped produce in these students, and we are excited about their bright futures. 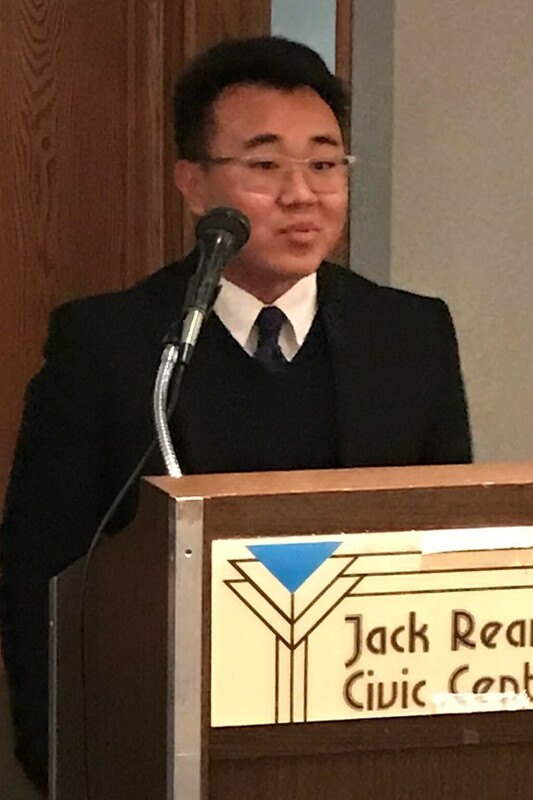 The male students, accompanied by family and school representatives, made short presentations before the Club on April 10th at its weekly luncheon. 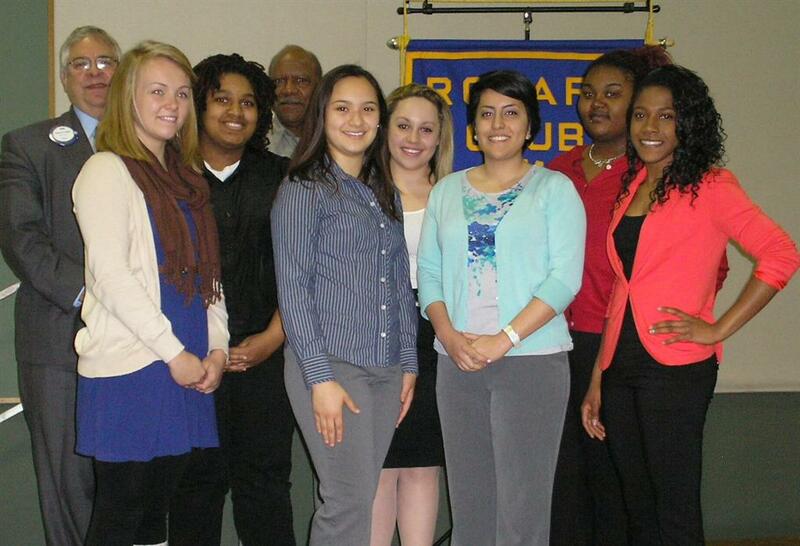 The female students presented to the Club on April 17th. The Club will choose one female and one male from these outstanding high school students to receive a $1,000.00 scholarship to be used at the college or university of their choice. The scholarships will be awarded at the Club's luncheon on May 1st. - Front Row (Left to Right): Coleton Nelson, Bonner Springs High School; Tony Shields, Jr., Washington High School; Ted Garcia, KCK Rotary Club member; Alexander Falk, Piper High School; Suan Sonna, Sumner Academy. - Back Row (Left to Right): Alizah Jones, Wyandotte High School; Adam Wilson, Bishop Ward High School; Fred Zimmerman, KCK Rotary Club President; Alex Gumminger, Turner High School. - Front Row (Left to Right): Katie Breitenstein, Bishop Ward High School; Precious Xiong, Washington High School; Vanessa Obi, Sumner Academy; Porcha Evans, Wyandotte High School. - Back Row (Left to Right): Ted Garcia, KCK Rotary Club member; Skylar Russell, Turner High School; Cara Bruce, Piper High School; Natalie Klotz, Bonner Springs High School; Fred Zimmerman, KCK Rotary Club President. The Kansas City, Kansas Rotary Club along with the Village West Rotary Club partnered with Grandview Park Presbyterian Church in an effort to bring clean water to storm ravaged Puerto Rico. Ten members of Grandview Park traveled to Caguas, P.R. to work with Catacumbas Church to do basic clean-up, demolition and construction in support of the devastated communities around Caguas. 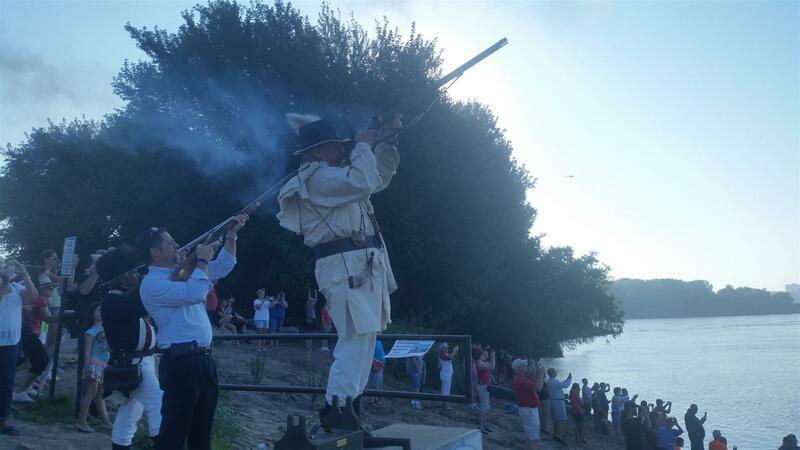 Two members of the team were Dr. Dee Ann Richards Behrens, member of Village West Rotary, and the Rev. Rick Behrens, member of Kansas City, Kansas Rotary. Just prior to the trip Dr. and Rev. Behrens learned of a need for water filters in homes and community centers they would be visiting. Dr. Behrens contacted Rotary partner Jorge Coromac with Woodland Public Charity to inquire about the water filters he assembles and distributes. Jorge gave the team a crash course in assembling and operating the filters made of simply plastic pails. As a result of this effort, ten filters were distributed to community centers and homes in Puerto Rico. Total cost of the project was $600 with $250 each contributed from the Village West and KCK clubs and $100 coming from Grandview Park Presbyterian Church. Grandview Park will be continuing in partnership with the Catacumbas Church in Puerto Rico, raising money, offering support, and traveling to help whenever needed. The Kansas City, Kansas Rotary Club, at its October 31, 2017 luncheon, recognized this year’s Public Safety professional from the Wyandotte County Sheriff’s Department. Annually the Club recognizes an outstanding public safety professional from the Sheriff Department. This Kansas City, Kansas Rotary Club program demonstrates and shows appreciation to the individuals who do so much to protect our community. The leadership of the Sheriff’s Department selects an outstanding individual from their department to receive this award, recognizing the individual’s dedication and service to our community. We would like to extend our gratitude to Detective Michael Simmons. He is a prime example of the great men and women of the Sheriff’s Department who are protecting us every day. Officer Moore, who has been with the department since 2008, was introduced by Sheriff Don Ash. He shared that he has known Detective Simmons since coaching him in little league. In addition to his other duties, the detective has been working with the U.S. Marshall’s Service on a joint task force. Michael’s wife and several co-workers accompanied him and Sheriff Ash at the award presentation. 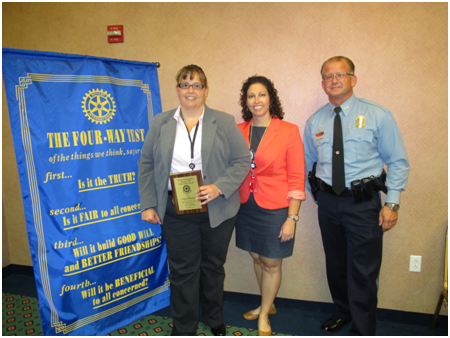 The Kansas City, Kansas Rotary Club, at its October 17, 2017 luncheon, recognized this year’s Public Safety professional from the Kansas City, Kansas Police Department. We would like to extend our gratitude to Officer Elaine Moore. She is a prime example of the great women and men of the KCK Police Department who are protecting us every day. Officer Moore, who is the department’s Juvenile Engagement Coordinator, was introduced by Police Chief Terry Ziegler. He shared highlights of Officer Moore’s professionalism and leadership including her work with homeless students while she was a School Resource Officer and starting a food distribution for families at the schools. Elaine’s husband Bill accompanied her and Chief Ziegler at the award presentation. The Kansas City, Kansas Rotary Club, at its October 10, 2017, luncheon, recognized this year’s Public Safety professionals from the Kansas City, Kansas Fire Department. We would like to extend our gratitude to Senior Captain Benjamin J. Huyett and Firefighter Brandon Rogers. They are prime examples of the great men and women of the KCK Fire Department who are protecting us every day. At the award presentation, Chief John Paul Jones introduced the firemen and told of their efforts in a recent fire. Also in attendance were a number of the station’s fellow firefighters. According to Chief Jones, upon arrival at a home under heavy fire, the two firefighters heard someone calling for help. They tried to enter from the backside of the structure, but due to the heavy fire, had to enter through the front porch of the building. Captain Huyett and Firefighter Rogers made entry to conduct a search. As Captain Huyett entered the structure he could hear a faint noise. As he advanced towards the rear of the home he found a female victim. The two firefighters moved the victim through the burning structure contending with fire, heat and heavy smoke and were met by other firefighters inside the front door. It was there where they handed the victim off to other firefighters and she was transported to the hospital. They then turned their attention to fighting the fire. If these firefighters had not acted without hesitation, the female victim would not have survived. The victim has since recovered from her injuries after several weeks in intensive care. The Kansas City, Kansas Rotary Club is dedicated to community service, and has completed a community wide beautification project. 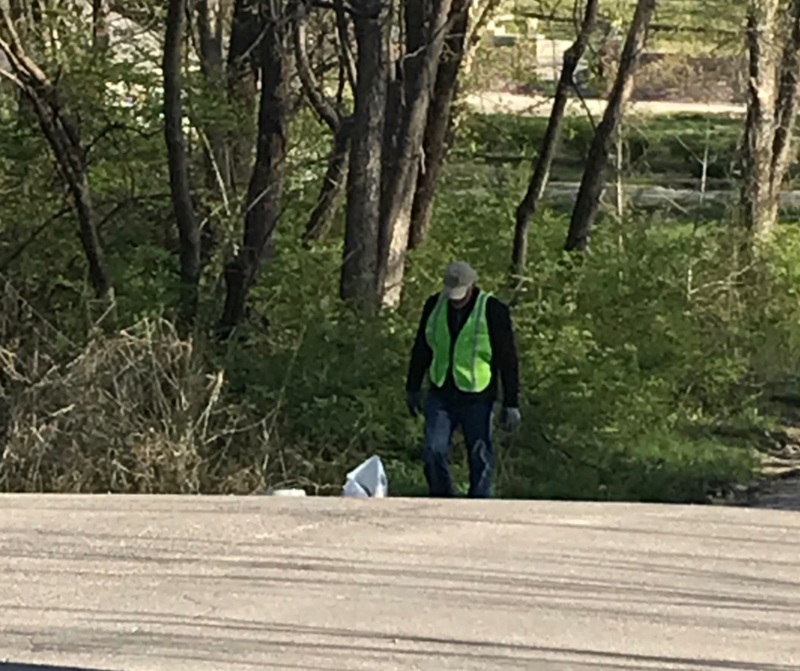 For the fourth year, the club purchased over 1,000 daffodil bulbs that were planted during October throughout the Wyandotte county area. 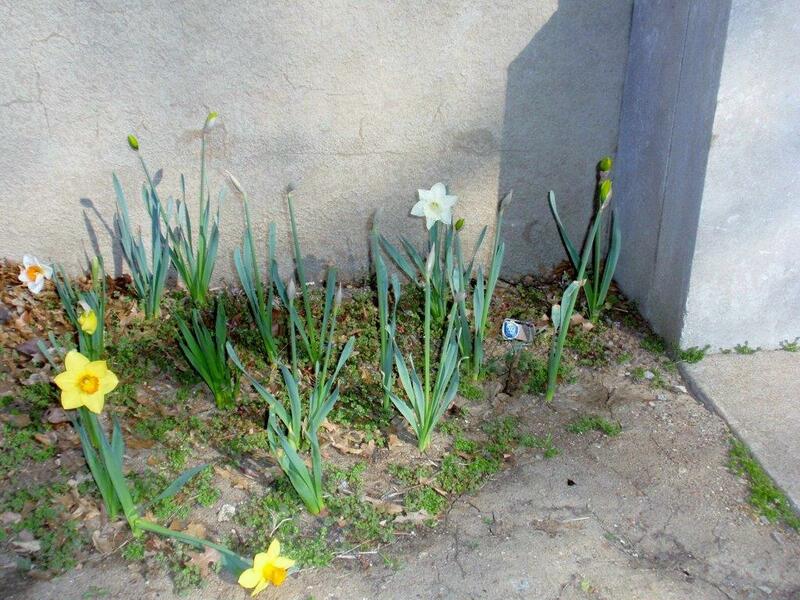 Daffodils are inexpensive, self-propagating and perennial plants that offer Spring beauty, yet are resistant to pests. There are a wide variety of species, which can make for interesting diversity in floral displays. The plantings were done by Rotarians, volunteers, and youth from elementary, middle and high schools. The plantings were carried out in chosen locations, visible to the community, in designated public areas of school grounds, where the flowers will not be likely mowed during the year. On the evening of June 27th, club members and guests enjoyed a night of fun with the installation of new officers and board members for a new year. Dave Skidgel acted as the Master of Ceremonies for the event. Out-Going President Ashley Adorante presented multiple Paul Harris Fellow awards, and thanked all members for their participation during the past year. In-Coming President Fred Zimmerman told members about his vision for the coming year. Past President Dan Duncan installed the new officers and directors. 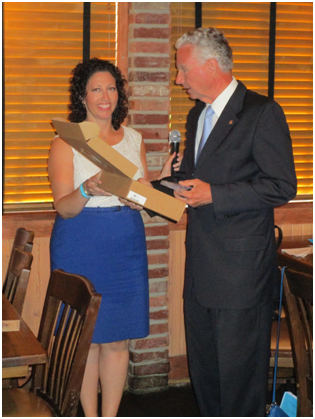 President-Elect Fred Zimmerman presents President Ashley Adorante her Past-President pin and plaque. The Kansas City, Kansas Rotary Club participated in 28th Greater Kansas City Day on April 6th of this year. The club has participated in every Greater Kansas City Day since its inception in 1988. Greater Kansas City Day sees Rotarians and other volunteers selling special editions of the Kansas City Star on street corners around the metro, always coinciding with the Royal’s home opener. The project raises money for the Rotary Youth Camp and other children’s charities. Funds raised by Rotarians of the Kansas City, Kansas Rotary Club this year were split between PACES (a program of Wyandot, Inc.) and the Boy Scouts. 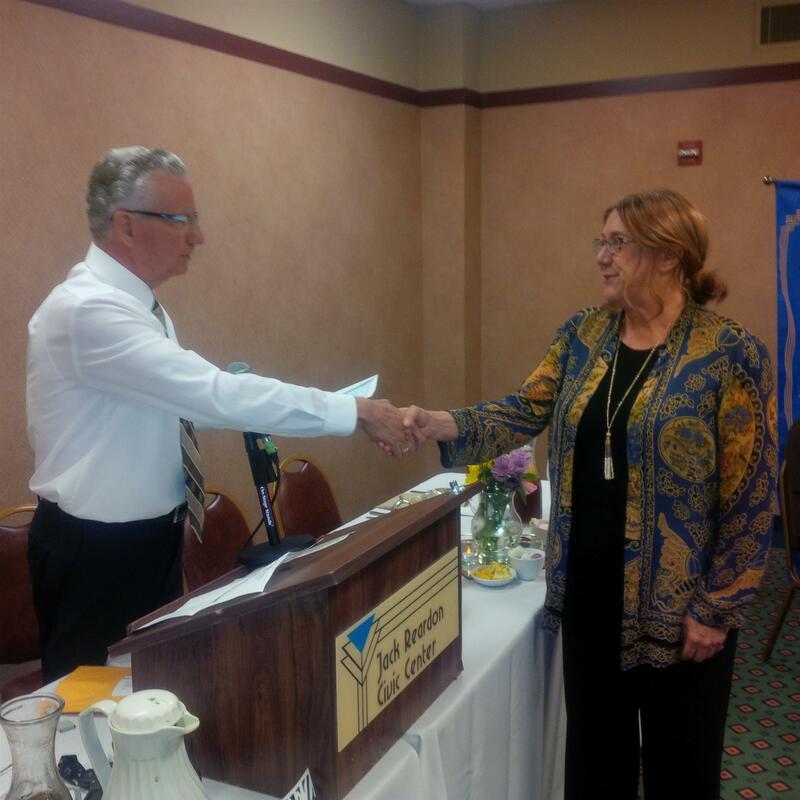 At the October 13th luncheon meeting of the club, a check for $428.14 was presented to Angela Dunn, Director of PACES. 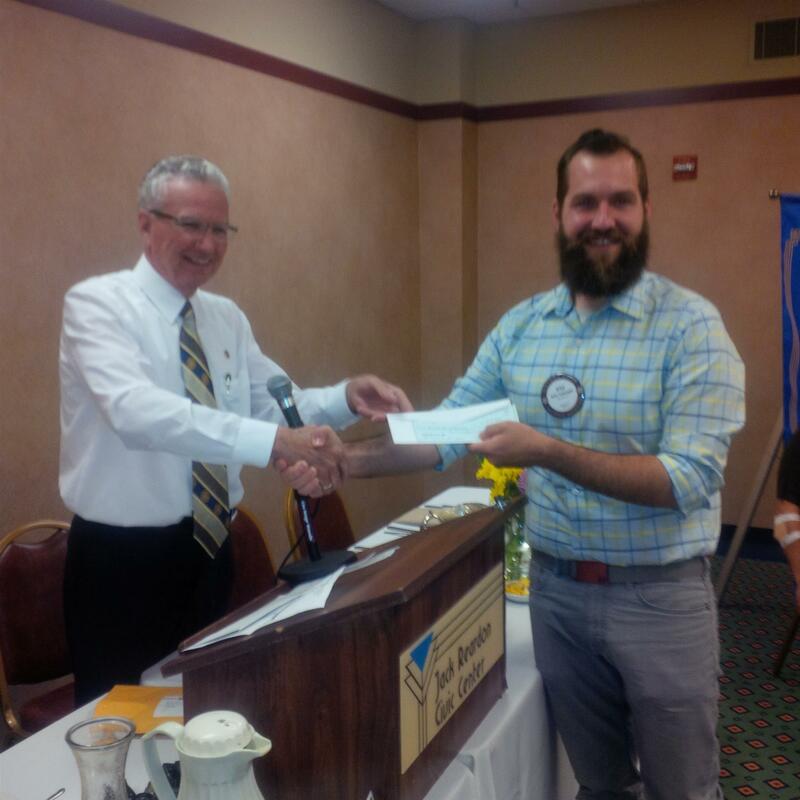 At the October 20th meetings, another $428.14 check was presented to Kyle Fulbright of the Boy Scouts. 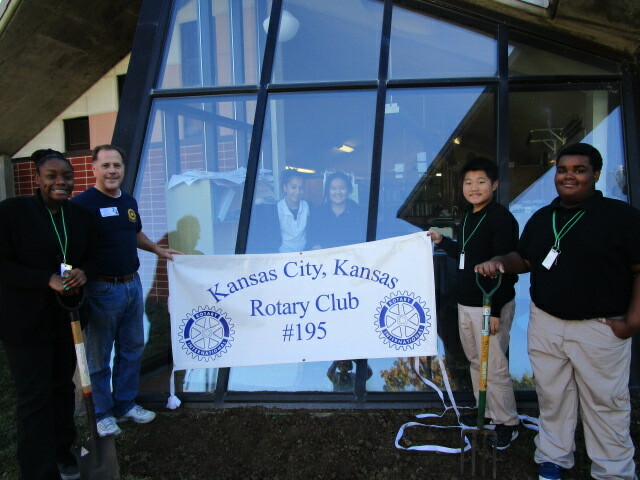 The Kansas City, Kansas Rotary Club participated in 29th Greater Kansas City Day on April 10th of this year. The club has participated in every Greater Kansas City Day since its inception in 1988. Greater Kansas City Day sees Rotarians and other volunteers selling special editions of the Kansas City Star on street corners around the metro, always coinciding with the Royal’s home opener. The project raises money for the Rotary Youth Camp and other local children’s charities. Funds raised by Rotarians of the Kansas City, Kansas Rotary Club this year were split between Rosedale Development Association (specifically their Camp Wildwood program) and the Boy Scouts. 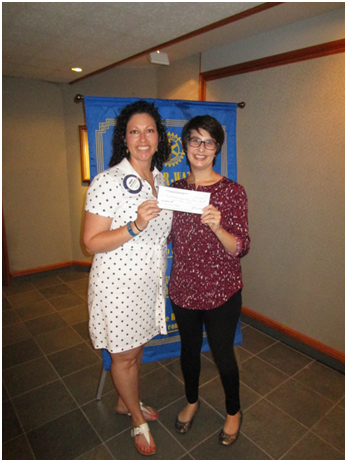 At the June 6th luncheon meeting of the club, a check for $363.33 was presented to Andrea Speere from Rosedale. 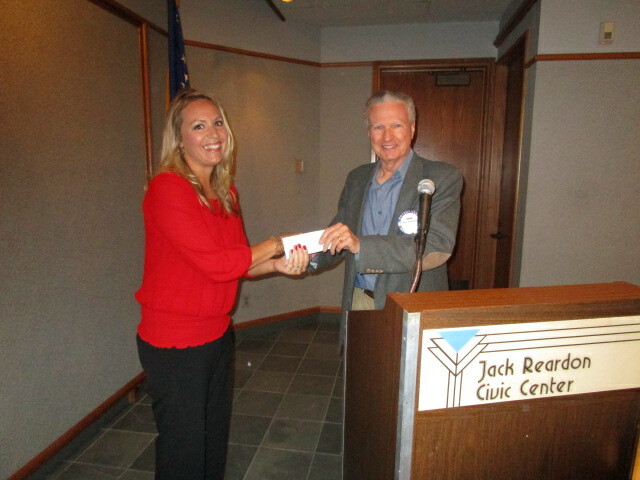 At the June 13th meetings, another $363.33 check was presented to Janell Neal of the Boy Scouts. 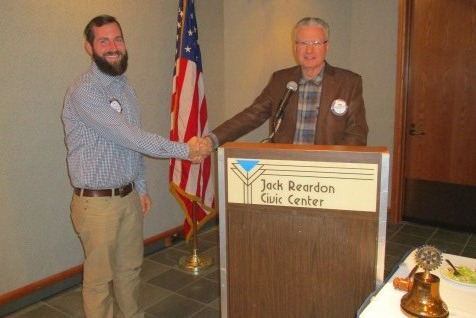 The Kansas City, Kansas Rotary Club announced the winners of its annual Student Scholarship Contest and recognized outstanding educators from each of the Wyandotte County high schools at the Club’s May 2nd luncheon meeting. The Club awarded $1,000 college scholarships to each of three area high school seniors: Alayna Dooley of Bonner Springs High School, Monica Romero of Turner High School, and Royal Sullivan of Sumner Academy. The Club awards these scholarships to the top female and male students who participate in the Club’s scholarship speech contest . Due to a tie for the female students, the club opted to award both top place females this year. These students competed with other outstanding high school students from Wyandotte County schools. All the students exemplify the highest academic, service and character standards in our community. We can all be proud of what Wyandotte County has helped produce in these students. 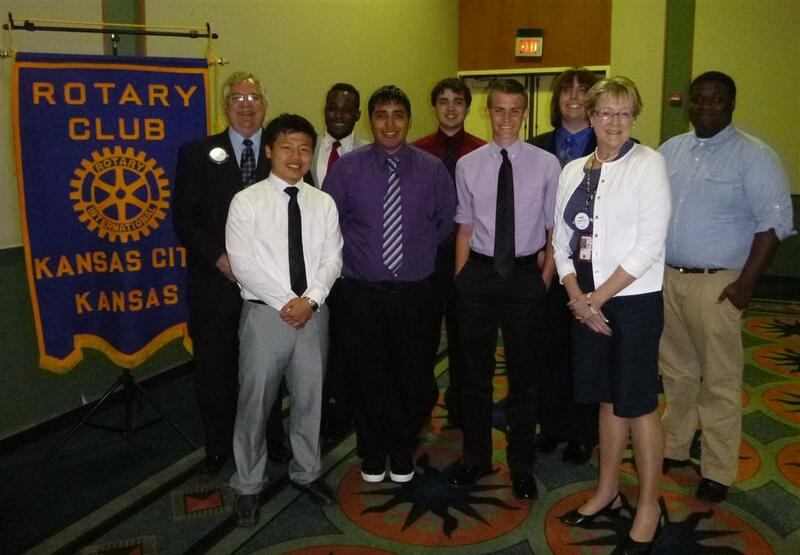 The Kansas City, Kansas Rotary Club congratulates them and wishes them the best in their pursuit of higher education. 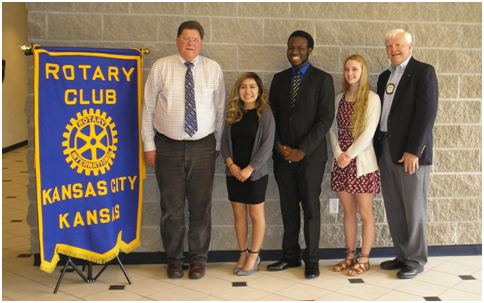 Student Scholarship Winners, pictured left to right:­­­ Fred Zimmerman (KCK Rotary Club Vice President); Monica Romero (Turner High School); Royal Sullivan (Sumner Academy); Alayna Dooley (Bonner Springs High School); and Pat Crilly (KCK Rotary Club). 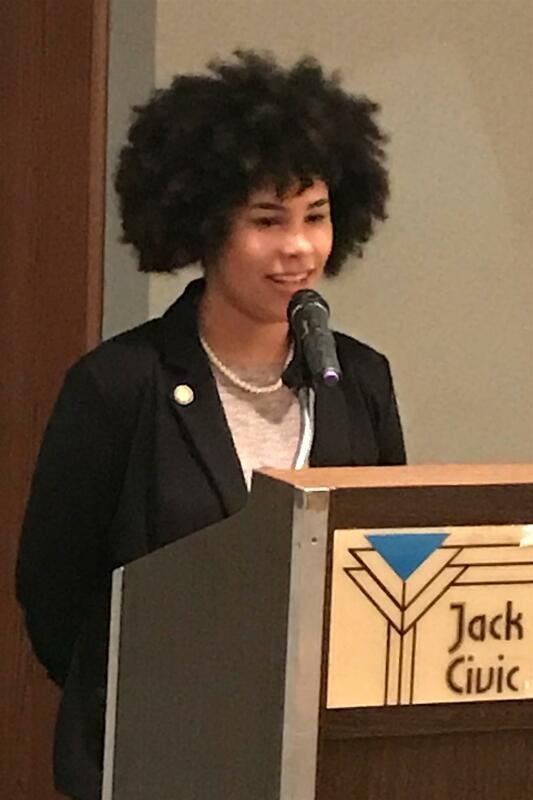 The Kansas City, Kansas Rotary Club, as part of its annual Student Scholarship Contest, recognized outstanding high school students from Wyandotte county schools. One female and one male student from each school are nominated by their respective schools to compete for $1000 college scholarships. All the students exemplify the highest academic, service and character standards in our community. We can all be proud of what Wyandotte county has helped produce in these students. And we are excited about want they can bring in the future. The female students, accompanied by family and school representatives, made short presentations before the club on April 11th at its weekly luncheon. The male students present on April 18th. The Club will choose one female and one male from these outstanding high school students to receive a $1000.00 scholarship at the college or university of their choice. The scholarships will be awarded at the Club's luncheon on May 2nd. 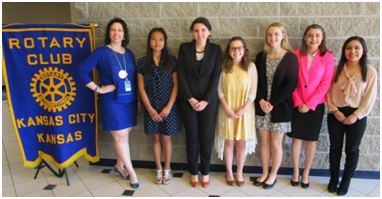 Left to Right: Ashley Adorante, KCK Rotary Club President; Ei Ei Pyoe, FL Schlagle High School; Lidija Begic, Bishop Ward High School; Cailin O’Mara, Piper High School; Alayna Dooley, Bonner Springs High School; Marley Lowe, Sumner Academy; and Monica Romero, Turner High School. 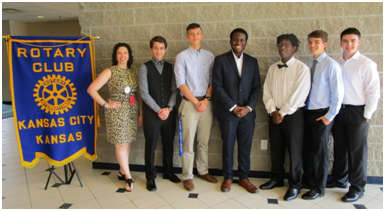 Left to Right: Ashley Adorante, KCK Rotary Club President; Thomas Fehlhafer, Bonner Springs High School; Jaxen Conejo, Bishop Ward High School; Royal Sullivan, Sumner Academy; Tywone Garrett, Jr., FL Schlagle High School; Jimmy Shultz, Turner High School; and Gabe Pappert, Piper High School. On February 28, 2017, the Rotary Club of Kansas City, Kansas hosted the annual State of the Unified Government of Wyandotte County and Kansas City, Kansas. The Club has a long history of hosting this annual address, dating back to the 1960's. 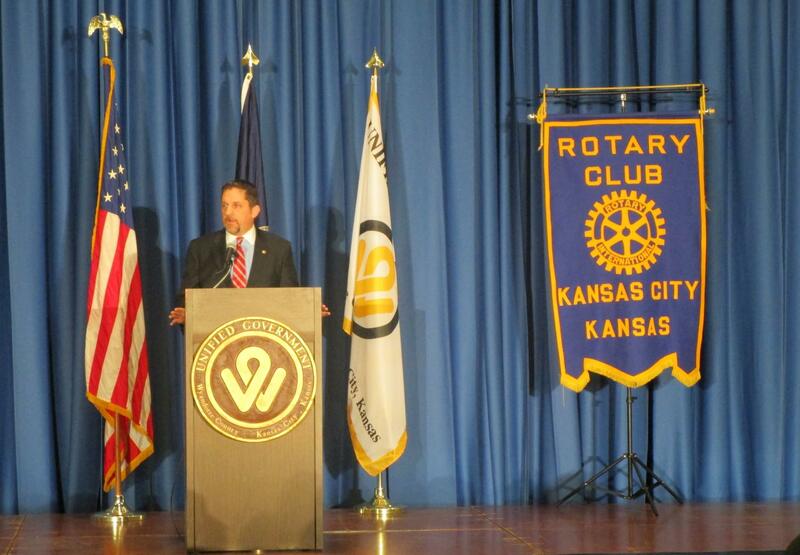 Mayor Mark Holland, a fellow member of the KCK Rotary Club, spoke to a crowd of over 400 persons, reviewing the past year in Wyandotte County. During the mayor’s presentation, he talked about how far the county has come since the city and county governments consolidated nearly 20 years ago. He went on to say that many challenges still lie ahead for our local government. He commented that property taxes have dropped this past year and he is working for another decrease this summer. He touched on the American Royal coming to Wyandotte County, the construction of the Amazon distribution which will employ 1,500 new jobs when open, and the continued expansion of the General Motors Plant and the Kansas University Medical Center. A big concern for Mayor Holland is the blight and poverty that still exists in the county, which will be a continued focus. An annual highlight of the Kansas City, Kansas Rotary Club is when the Sumner Academy Choir performs their Christmas concert for the club. On December 6th, the choir entertained club members and numerous guests at the weekly meeting. The Kansas City, Kansas Rotary Club is dedicated to community service, and has completed a community wide beautification project. 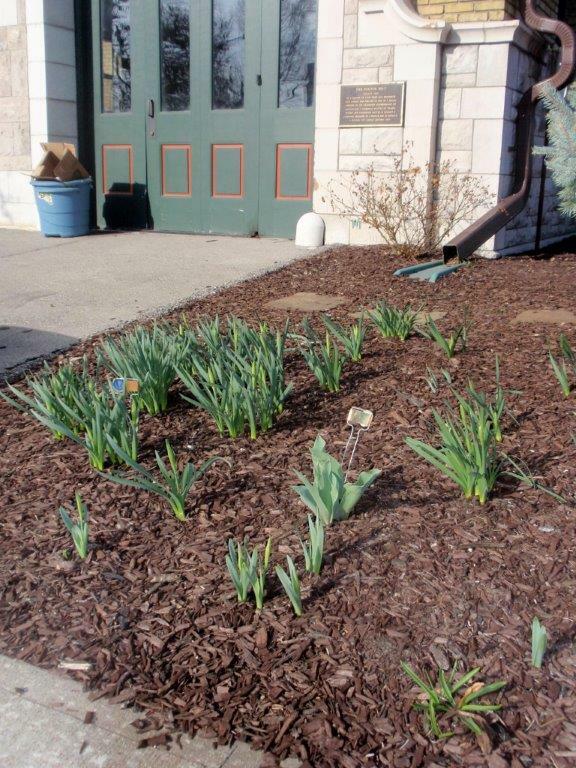 For the third year, the club purchased over 1,200 daffodil bulbs, that were planted during October throughout the Wyandotte county area. 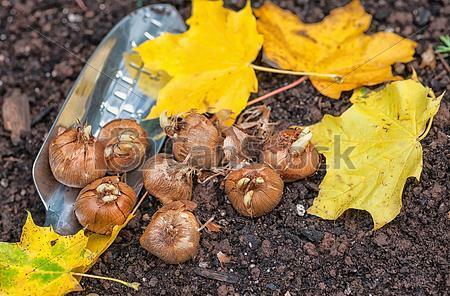 Daffodils are inexpensive, self-propagating and perennial plants that offer Spring beauty, yet are resistant to pests. There are a wide variety of species, which can make for interesting diversity in floral displays. 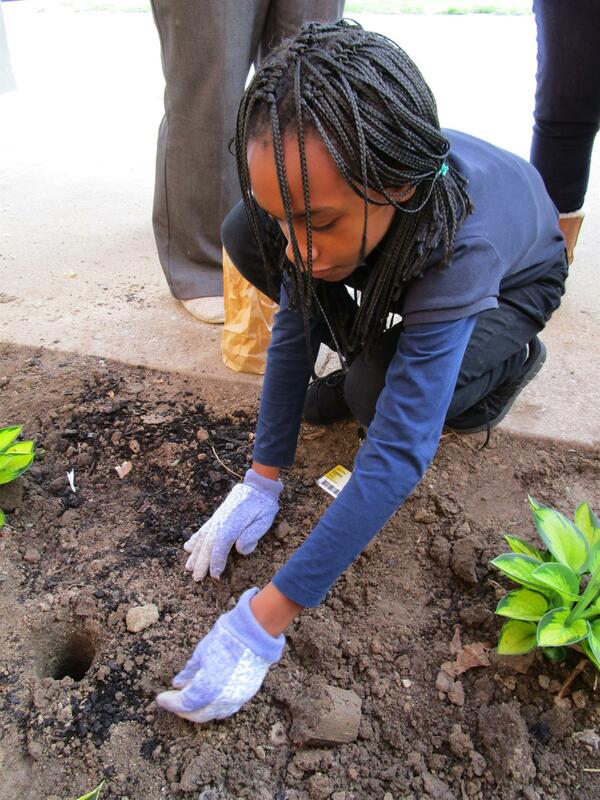 The plantings were done by Rotarians, volunteers, and middle school and high school youth. 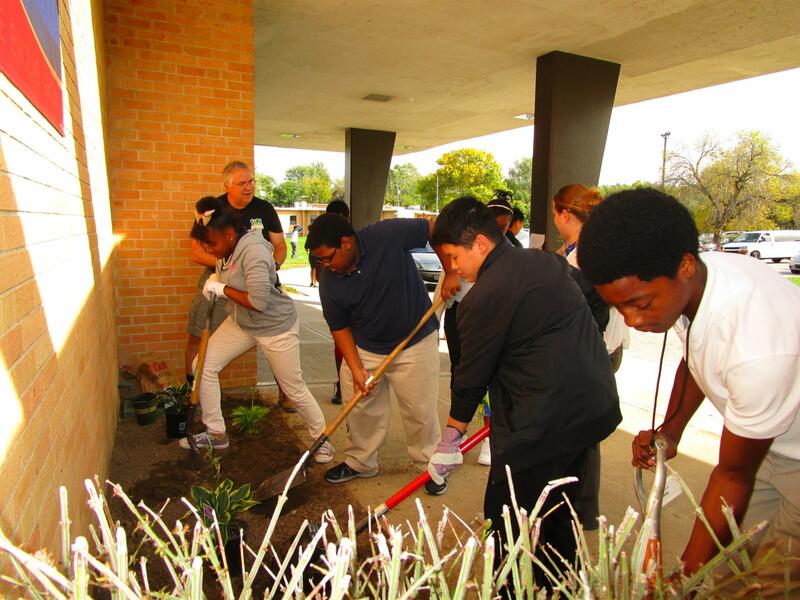 The plantings were carried out in chosen locations, visible to the community, in designated public areas of school grounds, where the flowers will not be likely mowed during the year. 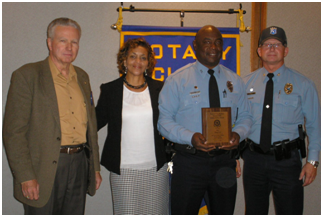 The Kansas City, Kansas Rotary Club, at its October 25, 2016, luncheon, recognized this year’s Public Safety professional from the Kansas City, Kansas Police Department. Annually the Club recognizes an outstanding public safety professional from the Police Department. This Kansas City, Kansas Rotary Club program demonstrates and shows appreciation to the individuals who do so much to protect our community. The leadership of the Police Department select an outstanding individual from their department to receive this award, recognizing the individual’s dedication and service to our community. We would like to extend our gratitude to Captain Pam Waldeck. She is a prime examples of the great women and men of the KCK Police Department who are protecting us every day. Captain Waldeck was introduced by Police Chief Terry Ziegler, who shared highlights of Captain Waldeck’s professionalism and leadership including her efforts starting a Peer Support Group in the department. Deputy Chief Rodney Smith accompanied Captain Waldeck and Chief Ziegler at the award presentation. On the evening of July 5th club members and guests enjoyed a night of fun with the installation of new officers and board members for a new year. Pat Crilly acted as the Master of Ceremonies for the event. Out-Going President Hank Chamberlain gave a report of the past year and then thanked all members for their participation during the year. President Ashley Adorante told members about her vision for the coming new year. Past District Governor Bill Mullarky installed the new officers and directors. President-Elect Ashley Adorante presents President Hank Chamberlain his Past-President pin and plaque. 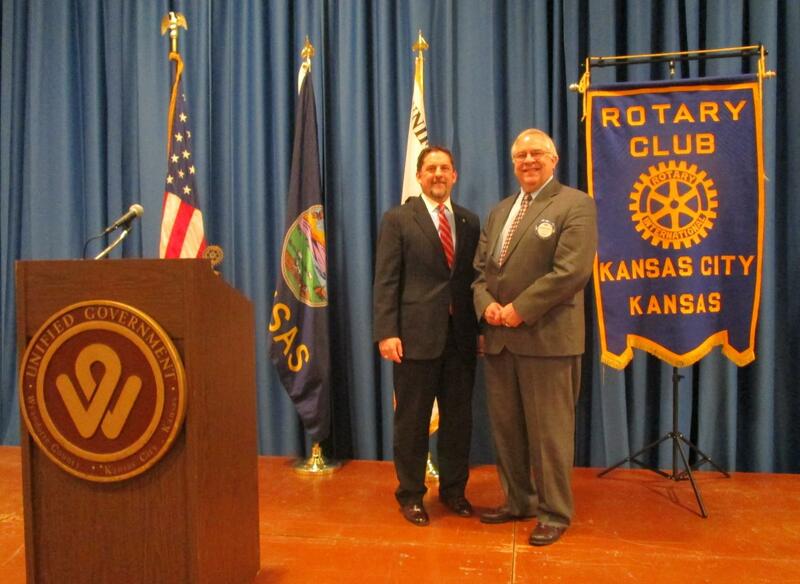 The Kansas City, Kansas Rotary Club participated in the 29th Greater Kansas City Day on April 1st of this year. The club has participated in every Greater Kansas City Day since its inception in 1988. Greater Kansas City Day sees Rotarians and other volunteers selling special editions of the Kansas City Star on street corners around the metro, always coinciding with the Royal’s home opener. The project raises money for the Rotary Youth Camp and other children’s charities. 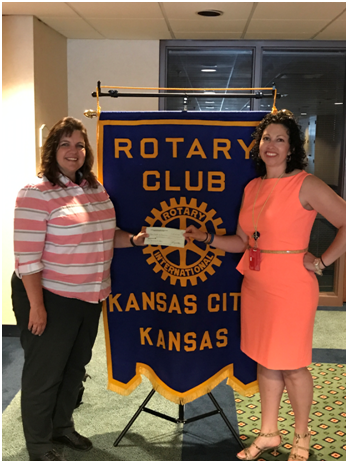 Funds raised by Rotarians of the Kansas City, Kansas Rotary Club this year were split between Turner House Clinic and the Boy Scouts. At the June 28th luncheon meeting of the club, checks for $490.25 each were presented to Sara Adams of Turner House Clinic and to Kyle Fulbright of the Boy Scouts. 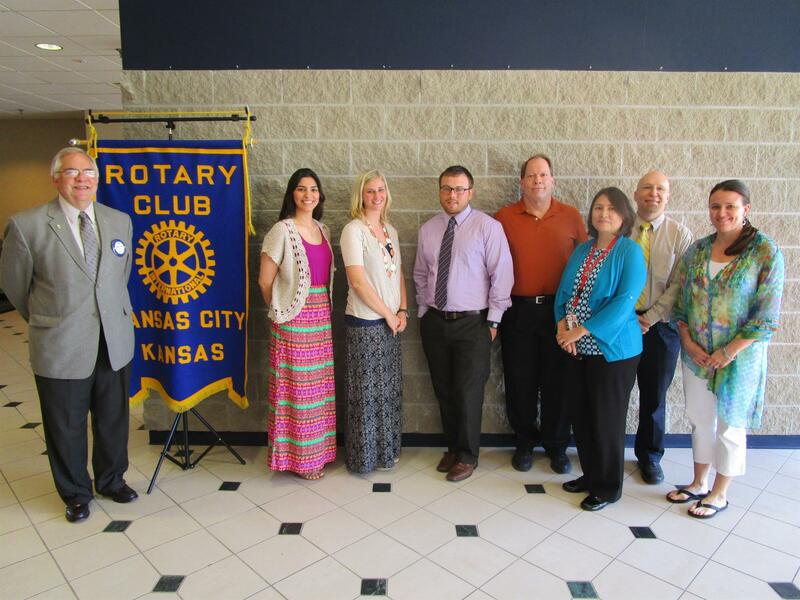 The Kansas City, Kansas Rotary Club, at its May 3rd luncheon, announced the winners of its annual Student Scholarship Contest and recognized outstanding teachers from each of the Wyandotte County high schools. The Club awarded $1,000 college scholarships to each of the winning students: Sydnei Patton of Sumner Academy and Alexander Trobough also of Sumner Academy. The Club awards two scholarships, one to the top female and one to the top male. These students competed with other outstanding high school students from the Wyandotte County schools. All the students exemplify the highest academic, service and character standards in our community. We can all be proud of what Wyandotte County has helped produce in these students. The Rotary Club congratulates them, and wishes them the best in their pursuit of higher education. In addition, annually the Club recognizes outstanding teachers from each of Wyandotte County's nine high schools. This is an annual program of the Kansas City, Kansas Rotary Club to show appreciation to teachers in the county that represent the best of our community. The teachers were introduced by their school’s administrators and the club was told of their unique contributions to the respective schools. Each was presented a plaque of appreciation by the Club. We are grateful to these teachers who give so much of themselves to educate and prepare our youth for the future. Outstanding High School Teachers; pictured left to right: Hank Chamberlain (KCK Rotary Club President), Dr. Michael Hotz (Wyandotte High School), Tamra Miller (Sumner Academy), Scott Hughes (Turner High School), Kathryn Holmes (JC Harmon High School), Kelly Lipovitz (Bishop Ward High School), LaDerrick Collins (Washington High School), Victoria Agcaoili (FL Schlagle High School), Kelly Hoopes (Bonner Springs High School), and Teri Beashore (Piper High School). The Kansas City, Kansas Rotary Club proudly celebrated the club’s Centennial on April 5th at Lake Quivira Country Club with a dinner gala. Rotary International was founded in 1905 in Chicago. On December 2, 1915, our Club #195 was organized in Kansas City, Kansas with 41 charter members. On January 1, 1916, the new club received its official charter and thus was born the Kansas City, Kansas Rotary Club, the 195th club of Rotary International. Over one hundred members and guests enjoyed a program celebrating the rich history of the club spanning the last one hundred years. Each member received a computer flash drive containing a booklet on the history of the club, along with copies of 100 years of weekly club bulletins. 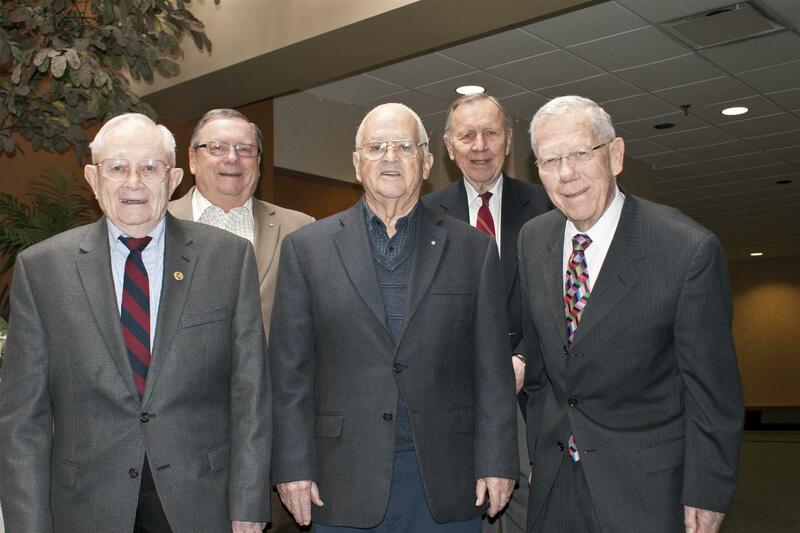 Special recognition was given to the 5 longest serving current members of the club representing over 250 years of Rotary service: Bill Mullarky, Bruce Schlosser, Jim Knight, Bill Strumillo and Bob Kimball. Additionally, Jim Knight was presented with an award for his over 47 years of service as Club Secretary. 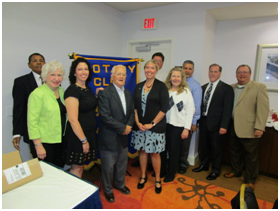 Rotary District Governor John Donovan presented the Club with a Rotary plaque commemorating its 100th anniversary. Mayor Mark Holland presented the club with a city proclamation honoring the club. The male students, accompanied by family and school representatives, made short presentations before the club on April 12th at its weekly luncheon. The female students on April 19th. The Club will choose one female and one male from these outstanding high school students to receive a $1000.00 scholarship at the college or university of their choice. The scholarships will be awarded at the Club's luncheon on May 3rd. 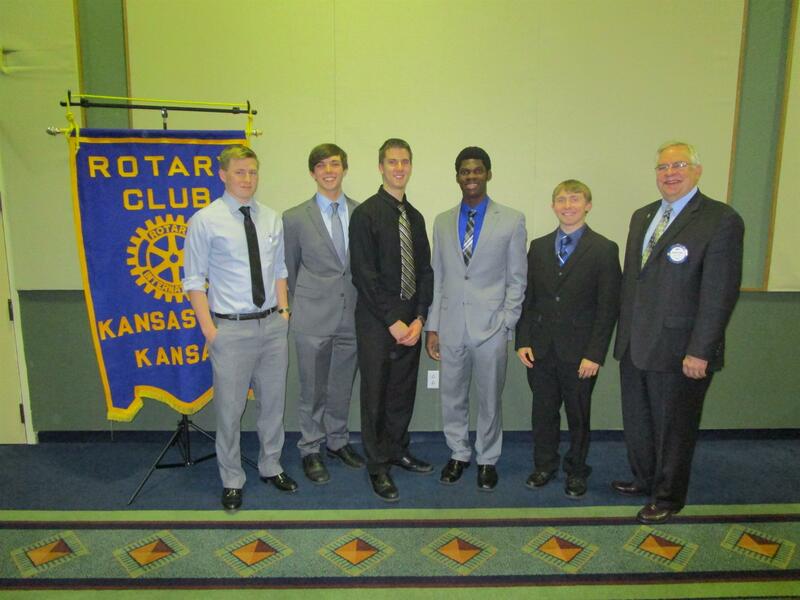 Left to Right: Hank Chamberlain, KCK Rotary President; Nathaniel Orel, Piper High School; Tyrone Hooks, Jr., FL Schlagle High School; Tyler Campbell, Bonner Springs High School; Evan Barclay, Bishop Ward High School; Alexander Trobough, Sumner Academy; Israel Villalobos, Wyandotte High School; JaMarkus Dawn, Washington High School; and Tucker Marine, Turner High School. 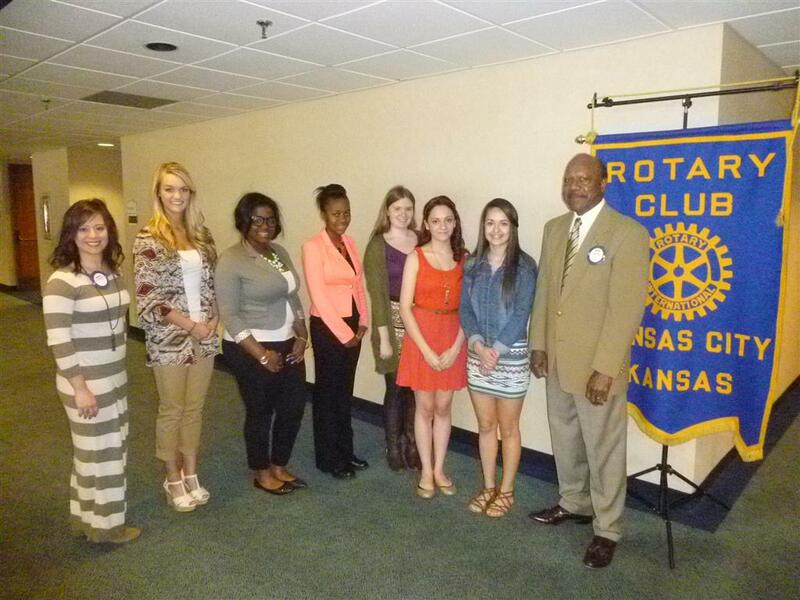 Left to Right: Hank Chamberlain, KCK Rotary President; Carolina Bueno, Wyandotte High School; Lauren Klapper, Piper High School; Jenna Kanoy, Turner High School; Sydnei Patton, Sumner Academy; Grace Sherrod, Bishop Ward High School; Julianne Jackson, Bonner Springs High School; and Liz Aguirre, Washington High School. On February 23, 2016, the Rotary Club of Kansas City, Kansas hosted the annual State of the Unified Government of Wyandotte County and Kansas City, Kansas. The Club has a long history of hosting this annual address, dating back to the 1960's. Mayor Mark Holland, a fellow member of the KCK Rotary Club, spoke to a crowd of over 425 persons, reviewing the past year in Wyandotte County. Mayor Holland’s three main themes this year were Economic Development, Innovations in Government and Healthy Communities. The Mayor took a very forward looking approach to improving our community, and making government function smarter and better. Among the issues covered was balancing property taxes and sales taxes, addressing blight, studies of government operations (specifically right-sizing the fire department), downtown and Indian Springs redevelopment, and next year’s tax windfall from Village West. The Kansas City, Kansas Rotary Club, at its October 27th and November 10th luncheons, recognized this year’s Public Safety professionals from the Kansas City, Kansas Police and Fire departments. Annually the Club recognizes an outstanding public safety professional from each department. This Kansas City, Kansas Rotary Club program demonstrates and shows our appreciation to the individuals who do so much to protect our community. The leadership of the Police and Fire departments select an outstanding individual from their department to receive this award, recognizing the individual’s dedication and service to our community. At the October 27th meeting, the club extended our gratitude to Patrolman Tony Lee. Police Chief Terry Zeigler introduced Officer Lee, and spoke of how he was instrumental in starting a new program of providing a bag of athletic balls for kids in our neighborhoods. 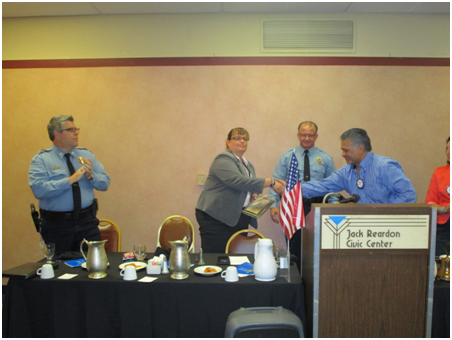 At the November 10th meeting, Rotary honored Fireman Mike Searcy. Fire Chief John Paul Jones introduced Fireman Searcy as this year’s “Fireman of the Year”. They were accompanied by Fireman Searcy’s wife and eight fellow firefighters. These two individuals are prime examples of the great men and women who are protecting us every day. The Kansas City, Kansas Rotary Club is dedicated to community service, and has completed a community wide beautification project. 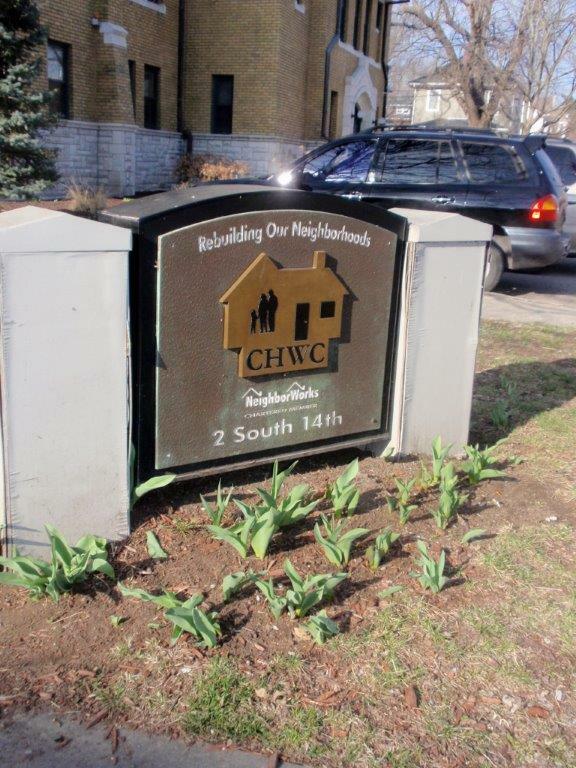 The club purchased 1,000 daffodil bulbs, that were planted during September and October throughout the Wyandotte county area. Daffodils are inexpensive, self-propagating and perennial plants that offer Spring beauty, yet are resistant to pests. There are a wide variety of species, which can make for interesting diversity in floral displays. 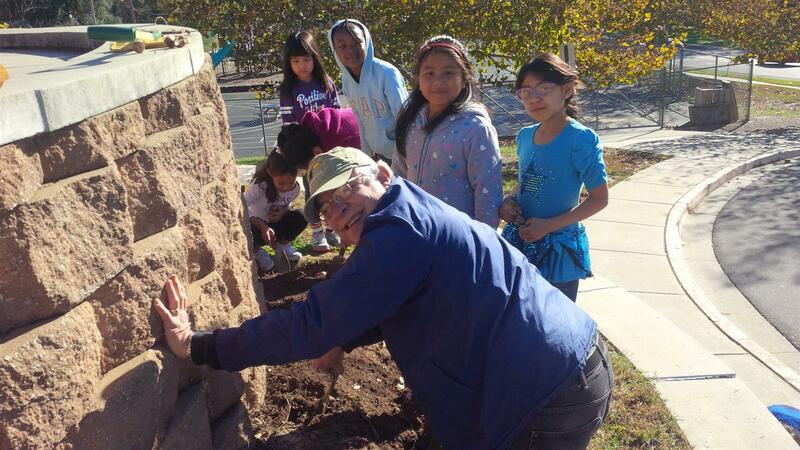 The plantings were done by Rotarians, volunteers, and middle school and high school youth. The plantings were carried out in chosen locations, visible to the community, in designated public areas of school grounds, where the flowers will not be likely mowed during the year. 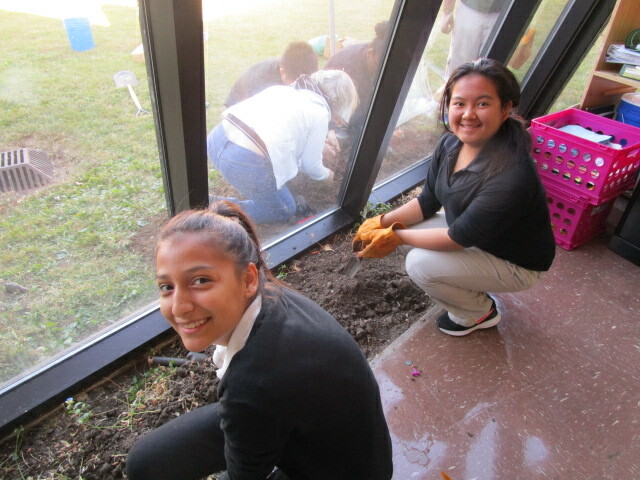 - Plantings at Coronado Middle School, with the help of students from Ms. Mary Turner’s 8th grade science class. On July 27th and 28th, Kansas City, Kansas Rotarians assisted with registration and logistics for the Missouri River 340 race. The Missouri River 340 is an endurance race across the state of Missouri. This year, the race ran from July 28-31, 2015. 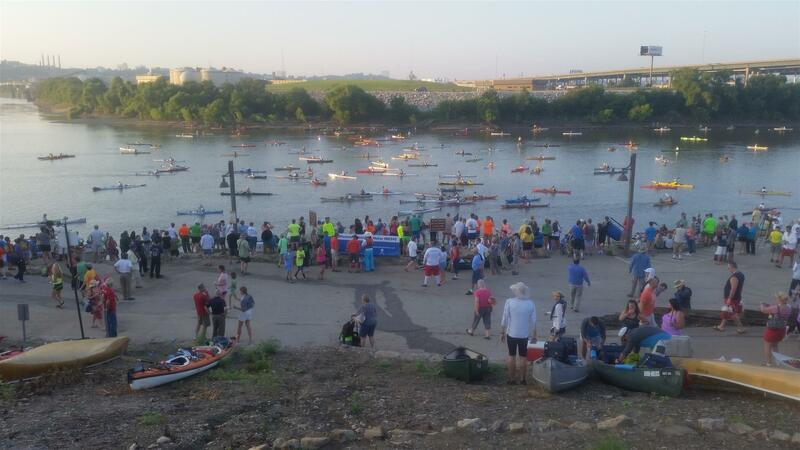 Competitors started in Kansas City, Kansas at Kaw Point Park and finished, some of them anyway, in St. Charles, Missouri. With numerous towns and hamlets, the course offers plenty of opportunity for resupply while in route. Participants are allowed exactly 88 hours to complete the course. There are nine checkpoints along the route where paddlers are required to sign in and sign out. To finish this race in 88 hours is a huge accomplishment. Only 2/3 of the teams were able to do that last year. There are no dams, locks or portages on this stretch of the Missouri River. - Rotarian and Unified Government Mayor, Mark Holland assists in the formal start of the race. 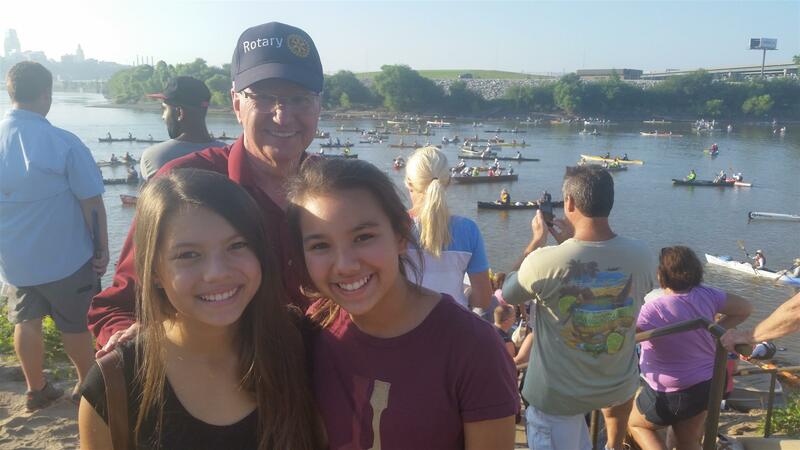 - KCK Rotary Club President, Hank Chamberlain and his granddaughters helped with traffic control. On the evening of June 23rd club members and guests enjoyed a night of fun with the installation of new officers and board members for a new year. Pat Crilly acted as the Master of Ceremonies for the event. President Ken Davis gave a report of the past year and then thanked all members for their participation during the year. President-elect Hank Chamberlain told members about his vision for the coming new year. Assistant District Governor MikeMcVey installed the new officers and then President Hank Chamberlain. President-Elect Hank Chamberlain presents President Ken Davis his Past-President pin and plaque. 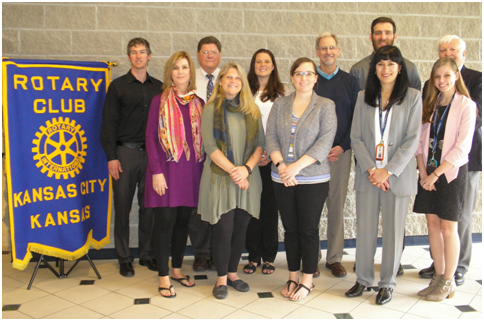 The Kansas City, Kansas Rotary Club, at its April 28th luncheon, announced the winners of its annual Student Scholarship Contest and recognized outstanding teachers from each of the Wyandotte County high schools. The Club awarded $1,000 college scholarships to each of the winning students: Anna Powell of Bishop Ward High School and Richard Cassidy also of Bishop Ward High School. The Club awards two scholarships, one to the top female and one to the top male. These students competed with other outstanding high school students from the Wyandotte County schools. All the students exemplify the highest academic, service and character standards in our community. We can all be proud of what Wyandotte County has helped produce in these students. The Rotary Club congratulates them, and wishes them the best in their pursuit of higher education. Outstanding High School Teachers; pictured left to right: Ken Davis (KCK Rotary Club President); Elizabeth Villanueva (J.C. Harmon High School); Ashley Kowalewski (Piper High School); Robert “Kam” Ridley (Bishop Ward High School); David King (Turner High School); Perla Weaver (Wyandotte High School); Dave Oland (Sumner Academy); and Tierney Thompson (Bonner Springs High School). Not pictured are Lydia DeGarmo (F.L. Schlagle High School) and Darwyn Thomlinson (Washington High School). Each year, the Kansas City, Kansas Rotary Club recognizes outstanding high school students from Wyandotte County High Schools. One young woman and one young man from each high school are nominated by a teacher, counselor, or principal of their respective school to compete for two $1,000 scholarships awarded by our Club. All of the students nominated exemplify the highest academic, service, and character standards in our community. All can be proud of what Wyandotte County schools have helped produce in these students. The community leaders, who are members of the Downtown Rotary Club of Kansas City, KS, are excited about what these young men and women will bring to the future. We are proud to be able to assist one young woman and one young man pursue their dreams in higher education with a $1,000 scholarship to attend a college or university of their choice. The young men candidates, accompanied by family and school representatives made their presentations to our Club on April 7th. The young women made their presentations on April 14th. The scholarship winners will be announced and awarded at our Club's luncheon meeting on Tuesday, April 28th. 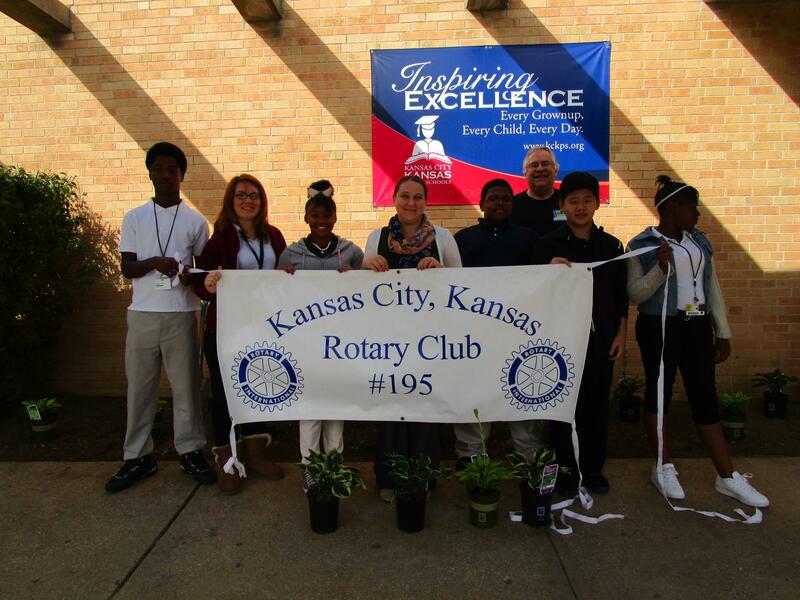 The Kansas City, Kansas Rotary Club is dedicated to community service, and in the fall of 2014 completed a community wide beautification project. 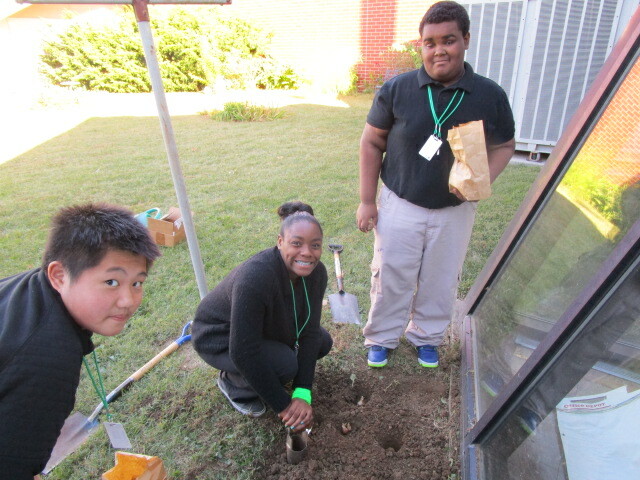 The club purchased 1,000 daffodil bulbs, that were planted during September and October throughout the Wyandotte county area. 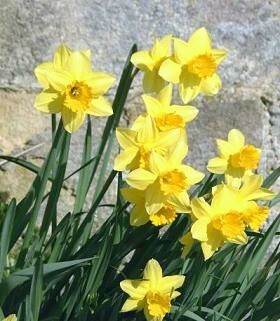 Daffodils are inexpensive, self-propagating and perennial plants that offer Spring beauty, yet are resistant to pests. There are a wide variety of species, which can make for interesting diversity in floral displays. The plantings were done by Rotarians, neighborhood volunteers, middle school and high school youth, community organizations, and the Unified Government Parks & Recreation Dept. The plantings were carried out in chosen locations, visible to the community, in designated public right-of-ways, parks or school grounds, where the flowers will not be likely mowed during the year. Those flowers are now making their appearance. On February 24, 2015, the Rotary Club of Kansas City, Kansas hosted the annual State of the Unified Government of Wyandotte County and Kansas City, Kansas. The Club has a long history of hosting this annual address, dating back to the 1960's. Mayor Mark Holland, a fellow member of the KCK Rotary Club, spoke to a crowd of 375 persons, reviewing the past year in Wyandotte County. Mayor Holland reviewed economic growth and progress on many fronts.The county has seen $1.26 billion of economic development in the last 2 years. The county is leading the state of Kansas in job creation. He also put a focus on the "Healthy Communities Wyandotte" initiative, and progress on the new "Healthy Campus" and community center in the downtown area. Mayor Holland gave the community an update of the effort, in partnership with the U.S. Department of Justice, to help the county boost the numbers of minorities in all facets of the government and public safety forces. 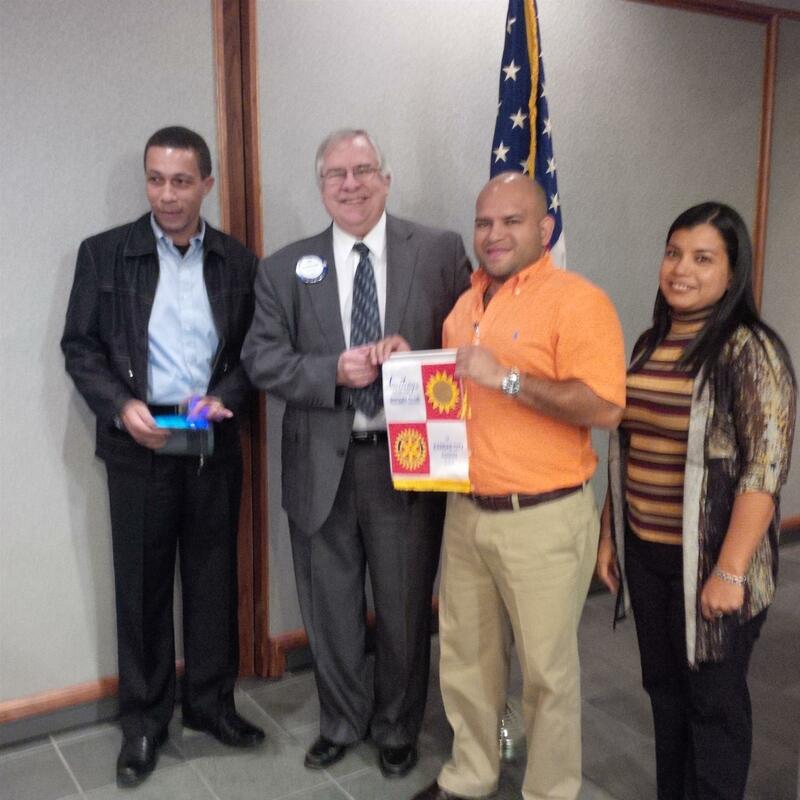 On January 20, 2015 the Kansas City Kansas Rotary Club hosted the 2015 District 5710 Vocational Training Team (VTT) from Panama at the club's weekly luncheon. Three members of the Panama VVT attended the meeting. 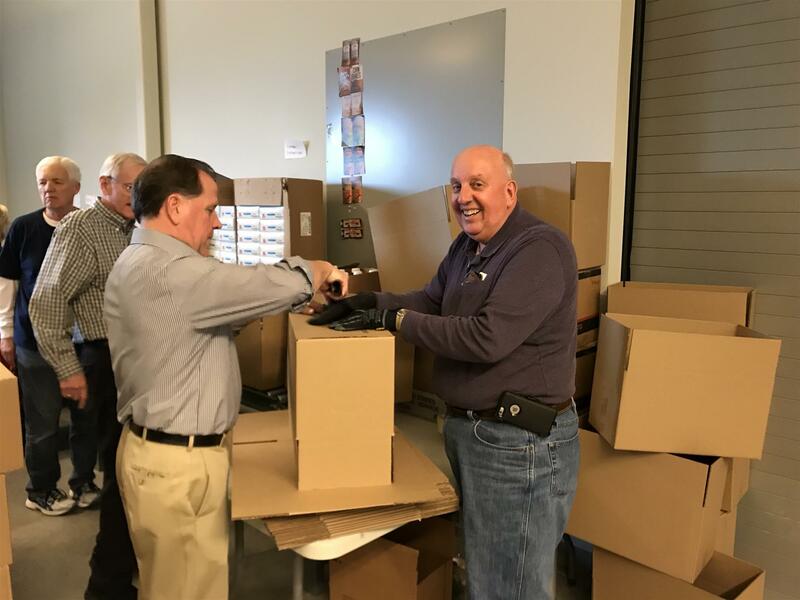 Also present were Chuck Udell, a member of the Leawood Rotary Club, who is serving as the VTT Coordinator to the group and Rotarian Jorge Coromac, who helped organize the VVT. Rotary member Jose Manuel Espinosa Perez of the El Dorado, Panama Rotary Club presented the team and showed a power point presentation about the history of his club, his country, and what their team hoped to accomplish here in Kansas. He told and showed members what projects they were doing in Panama. He went on to say that their projects would not be possible without grants from Rotary Clubs. Another member of the team, Licda Yaritza Pena, thanked Rotarians for their support and the opportunity they have in coming to our District. Dr. Juan Jose Ayola was the other member of the Team in attendance. While in District 5710, the team will receive training in numerous fields; including health care, emergency preparedness, and distance learning. 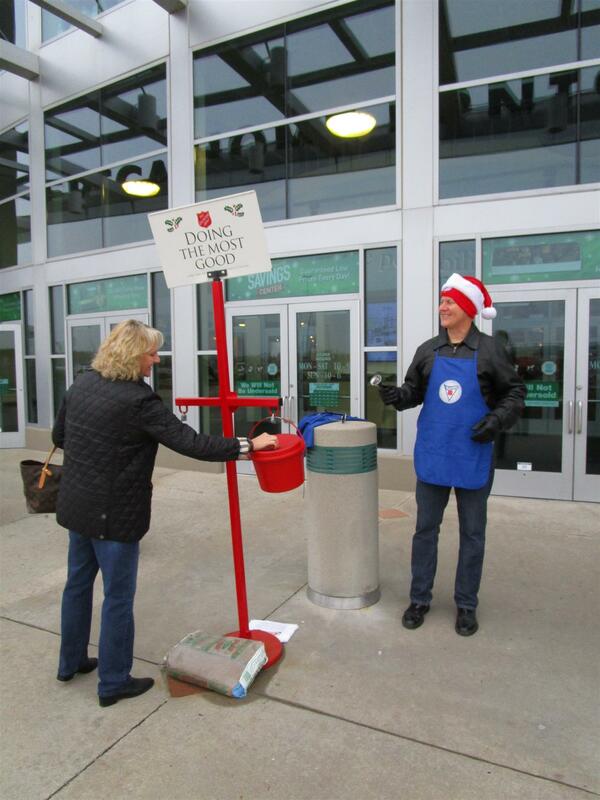 On a windy December day, members of the Kansas City, Kansas Rotary Club rang bells for the Salvation Army at Nebraska Furniture Mart. 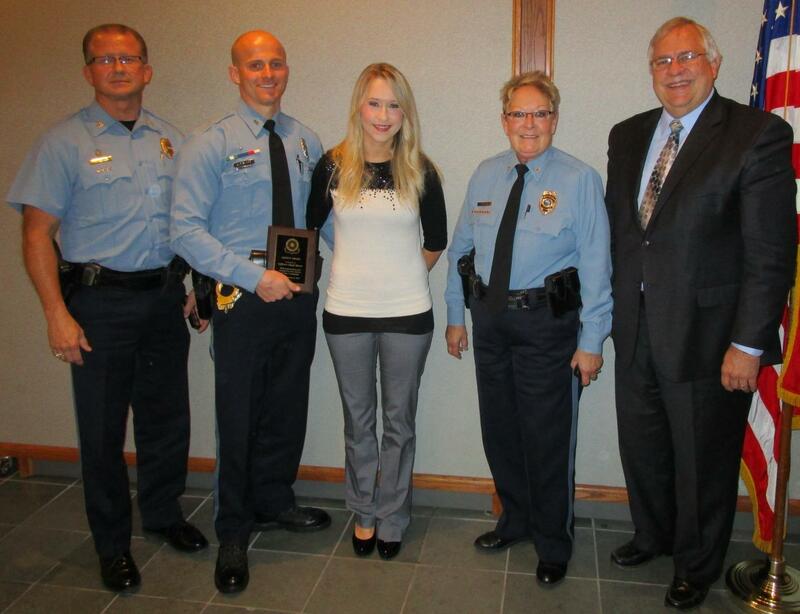 The Kansas City, Kansas Rotary Club, at its October 21, 2014, luncheon, recognized this year’s Public Safety professional from the Kansas City, Kansas Police Department. Annually the Club recognizes an outstanding public safety professional from the Police Department. 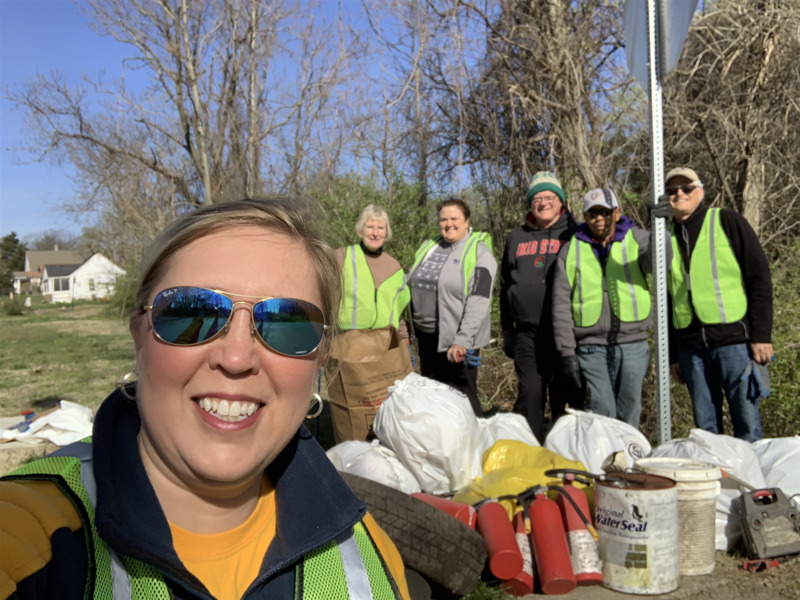 This Kansas City, Kansas Rotary Club program demonstrates and shows our appreciation to the individuals who do so much to protect our community. The leadership of the Police Department select an outstanding individual from their department to receive this award, recognizing the individual’s dedication and service to our community. We would like to extend our gratitude to Officer Chad Shore. He is a prime example of the great men and women of the KCK Police Department who are protecting us every day. Officer Shore was introduced by Police Chief Ellen Hanson, who shared highlights of Officer Shore’s career, professionalism and heroism. Lt. Col. Terry Zeigler, Major Tom McMillan and Chad’s wife Holly Shore also accompanied Officer Shore and Chief Hanson at the award presentation. 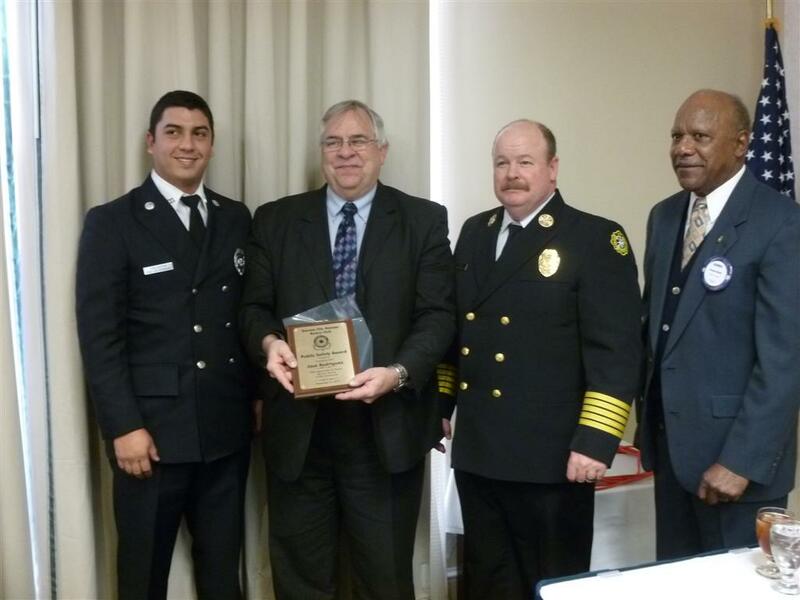 The Kansas City, Kansas Rotary Club, at its November 12th luncheon, recognized the 2013 Public Safety professional from the Kansas City, Kansas Fire Department. We would like to extend our gratitude to Firefighter Jose Rodriquez. He is a prime example of the great men and women who are protecting us every day. Fireman Rodriquez was introduced by Fire Chief, John Paul Jones. The Chief shared several stories highlighting Fireman Rodriquez's professionalism and heroism. Congratulations Fireman Rodriquez! The Kansas City, Kansas Rotary Club participated in 27th Greater Kansas City Day on April 2nd of this year. The club has participated in every Greater Kansas City Day since its inception in 1988. Greater Kansas City Day sees Rotarians and other volunteers selling special editions of the Kansas City Star on street corners around the metro, always coinciding with the Royal’s home opener. The project raises money for the Rotary Youth Camp and other children’s charities.Funds raised by Rotarians of the Kansas City, Kansas Rotary Club this year were split between Associated Youth Service (AYS) and the Boy Scouts. 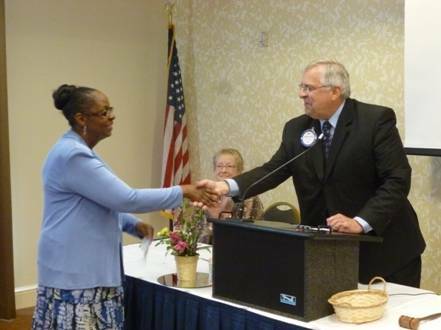 At the July 1st luncheon meeting of the club, a check for $417.37 was presented to Debra Terrell McKenzie of AYS. A check will be presented to the Boy Scouts at a future meeting. Each year, the Downtown Kansas City, Kansas Rotary Club recognizes outstanding high school students from Wyandotte County school. One young woman and one young man from each high school are nominated by a teacher, counselor, or principal of their respective school to compete for two $1,000 scholarships awarded by our Club. The young women candidates, accompanied by family and school representatives made their presentations to our Club on April 8th. The young men made their presentations on April 15th. The scholarship winners will be announced and awarded at our Club's luncheon meeting on Tuesday, April 29th. Downtown KCK Rotarians and their families gathered at the home of Donna Severance on Sunday, November 17th to watch our Kansas City Chiefs take on the Denver Broncos! A great time was had by all! 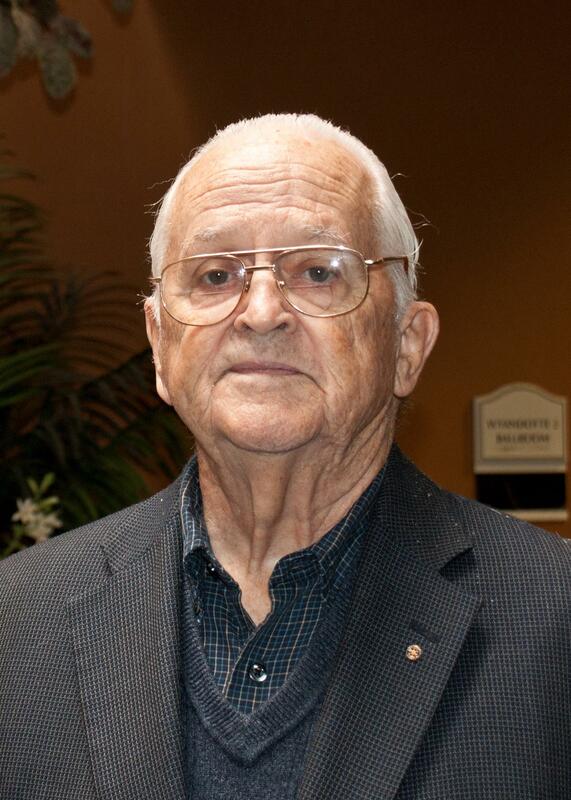 I am proud to announce a new biography about Rotary Founder - Paul Harris. This fresh look at the man and his times is based on the discovery of hundreds of never before published letters, documents and exclusive archival sources. I cordially invite all Rotarians to learn hundreds of new facts about “Paul Harris and the Birth of Rotary” by visiting my web page at http://www.PaulHarrisBook.com where the book can be purchased by linking to either CreateSpace or Amazon.com. ($25.00 plus S&H) A Kindle version is also accessible. A special autographed edition can be ordered directly from me at a reduced cost of $21.50 total. Please e-mail FredCarvin@PaulHarrisBook.com and I will send you a copy. Please be sure to include your mailing address. Multiple purchase discounts are available. It’s a great gift idea for specific Rotarians, club libraries, or honored guests. 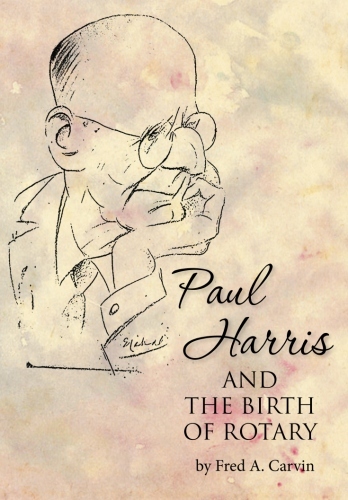 This book is not a general history of Rotary but rather is the story of one man’s life long struggle to find his inner self and how the philosophy of Paul Harris changed the world. Certainly if you have any questions or need additional information, please contact me. 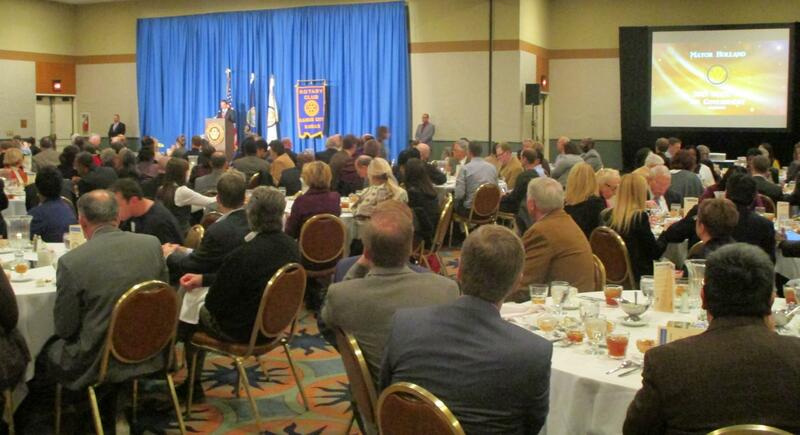 This past April, the Kansas City, Kansas Rotary Club participated in the 26th annual Greater Kansas City Day. Greater Kansas City Day, is a collaboration between the Kansas City Star, the Kansas City Royals and many metro area Rotary Clubs, including the Rotary Club of Downtown Kansas City, KS. On Opening Day for the Royals, thousands of volunteers take to the streets to sell Royals Home Opening special edition copies of The Kansas City Star for a donation. These donations have helped fund the Rotary Youth Camp and other local charities. On August 6th, our Club made cash awards to Sunflower House and the Boys Scouts of Greater Kansas City to assist them with the work they do with area youth. Club president George Moody presented $355.00 checks each, to the Boy Scouts and Sunflower House. Accepting for the Boy Scouts was Rotarian, Khary Floyd, and for Sunflower House was Michelle Herman. 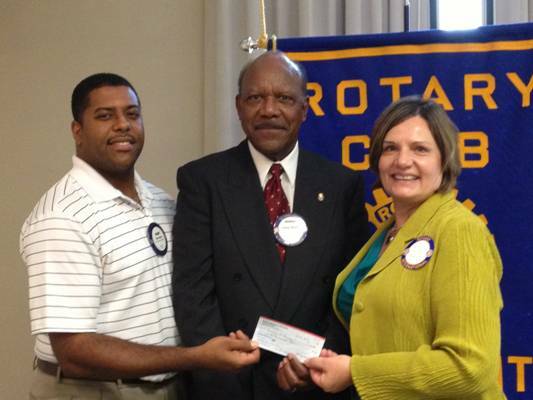 To learn more about our Rotary Club, please visit our website at www.rotarydowntownkck.org. The Kansas City, Kansas Rotary Club, as part of its annual Student Scholarship Contest, recognized outstanding high school students from each of the nine Wyandotte county schools. One female and one male student from each school are nominated by their respective schools to compete for $1000 college scholarships. All the students exemplify the highest academic, service and character standards in our community. We can all be proud of what Wyandotte county has helped produce in these students. And we are excited about want they can bring in the future. The female students, accompanied by family and school representatives, made short presentations before the club on April 23rd at its weekly luncheon. The male students on April 30th. The Club will choose one female and one male from these outstanding high school students to receive a $1000.00 scholarship at the college or university of their choice. The scholarships will be awarded at the Club's luncheon on May 14th.